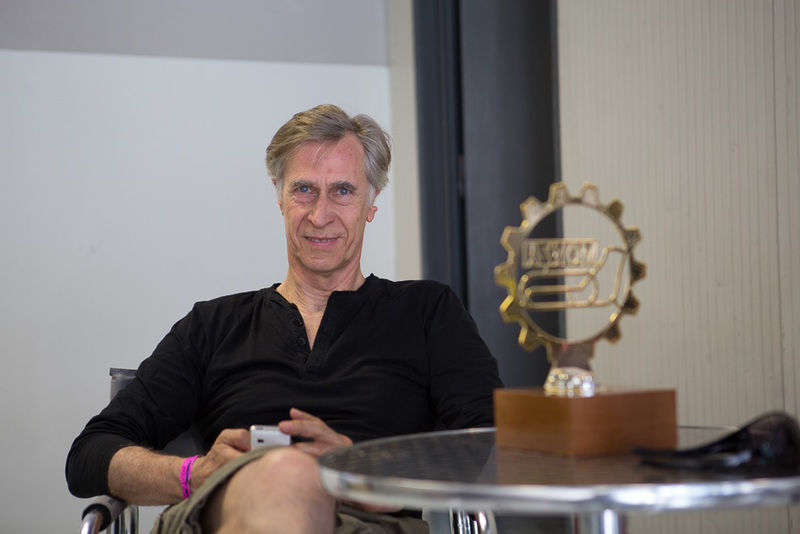 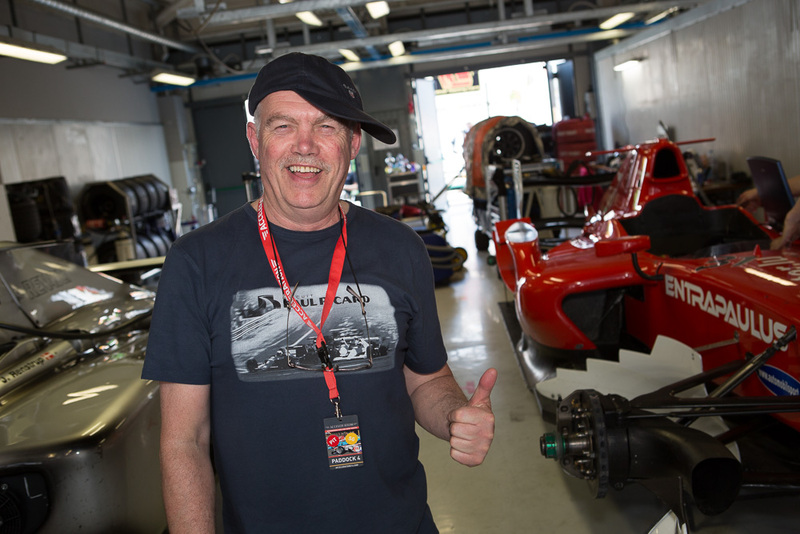 Get on-board with the BOSS GP championship leader Gary Hauser. 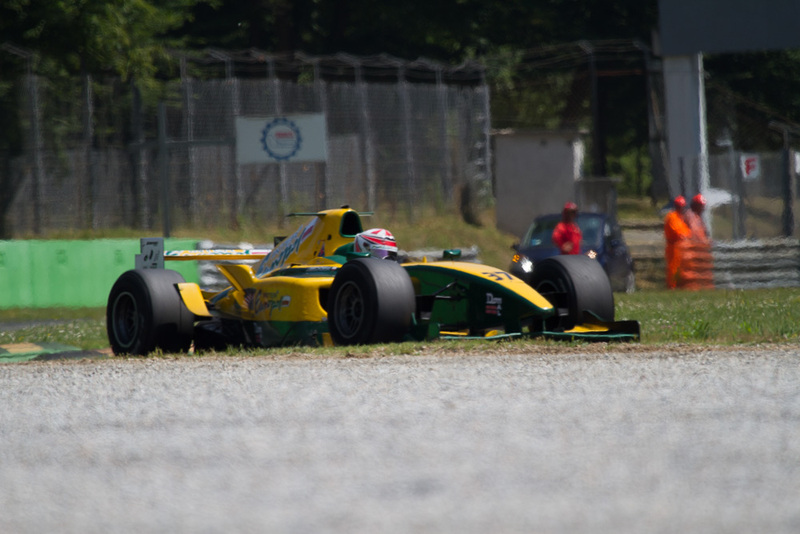 Some highlights are the collision with Peter Milavec (0:12) while trying to overtake Gary after the start and the fight for the top position with Ingo Gerstl at the end of race 1 (1:10+). 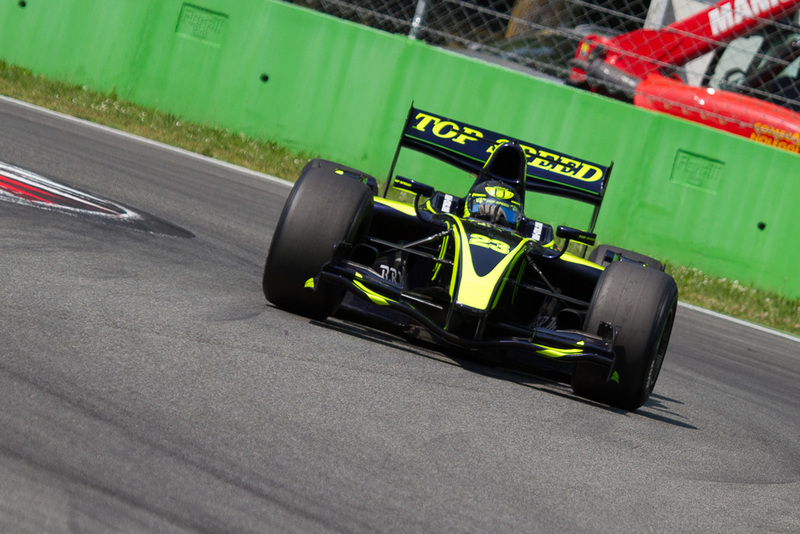 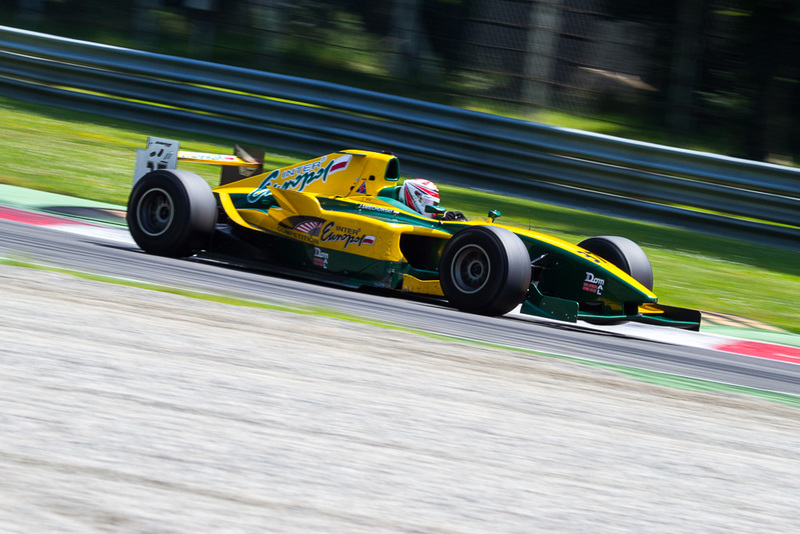 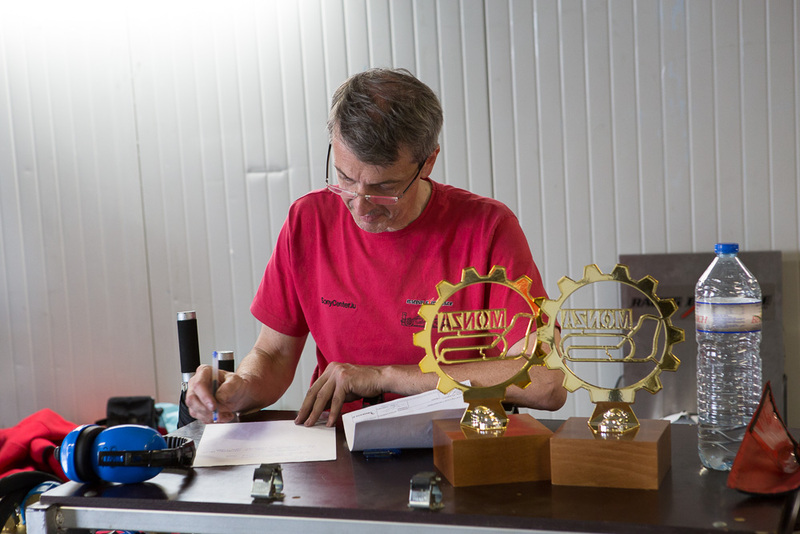 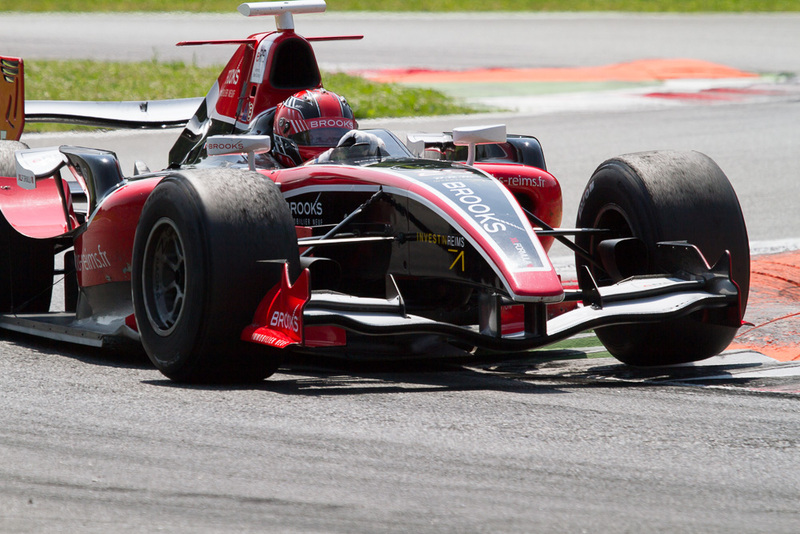 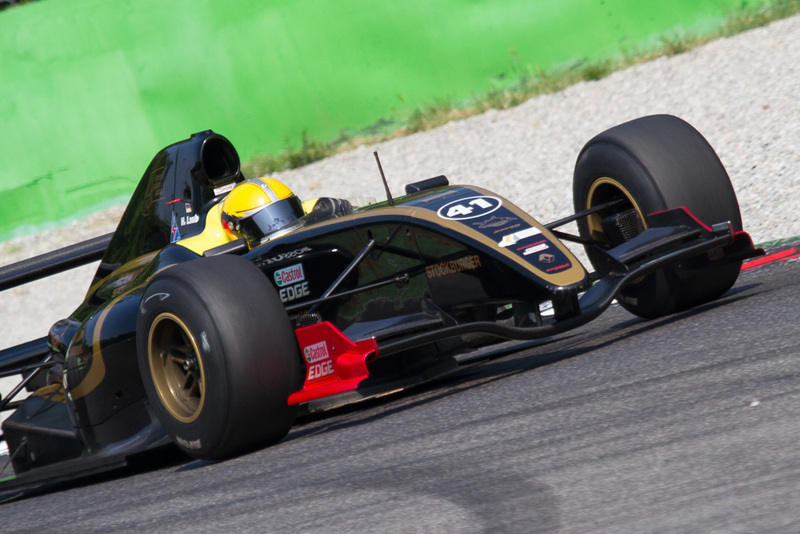 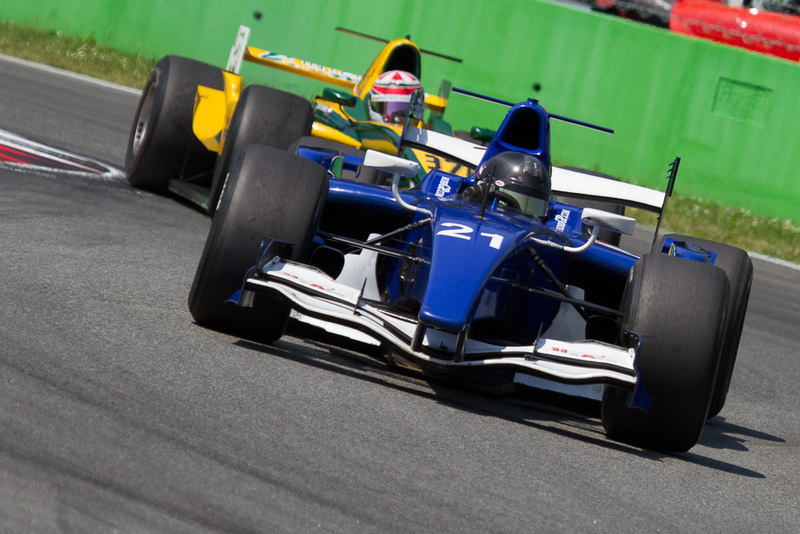 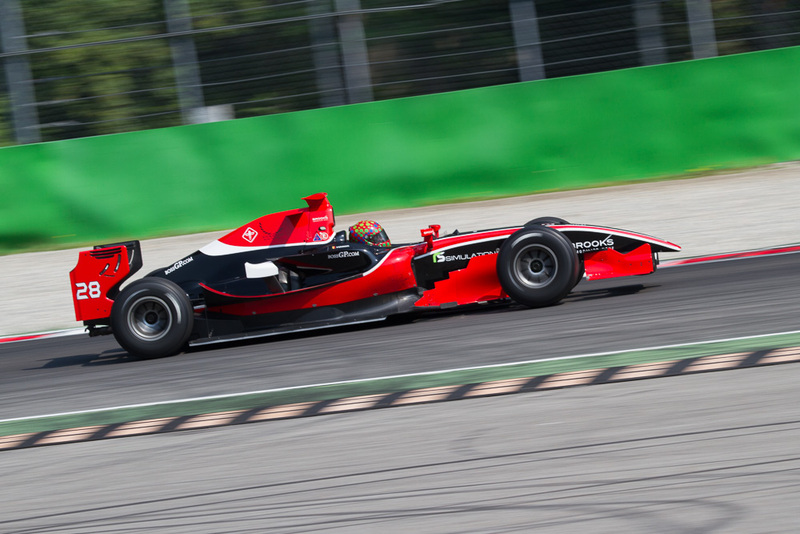 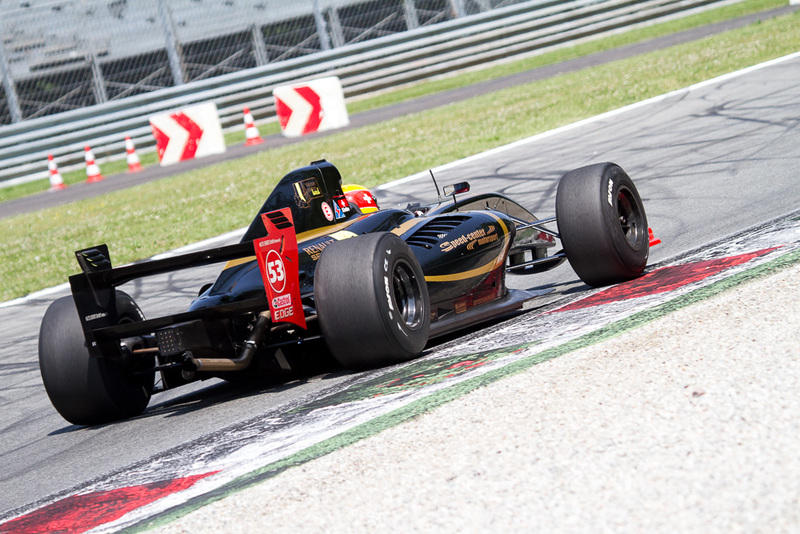 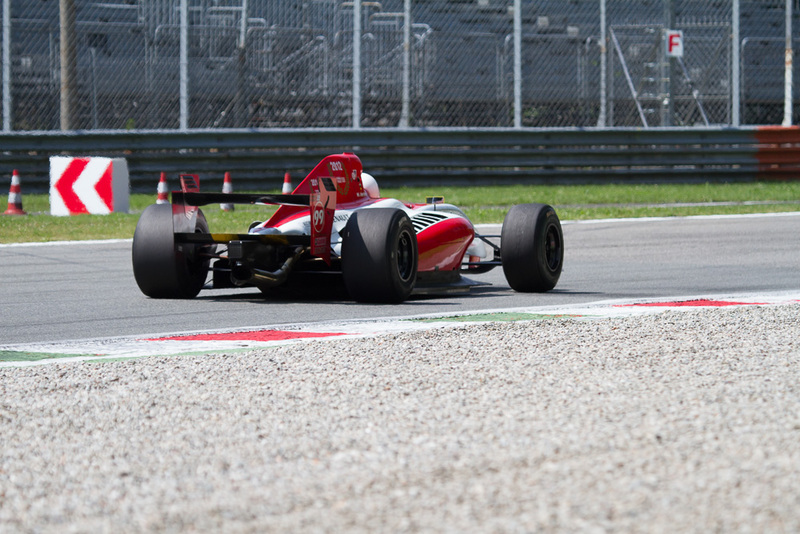 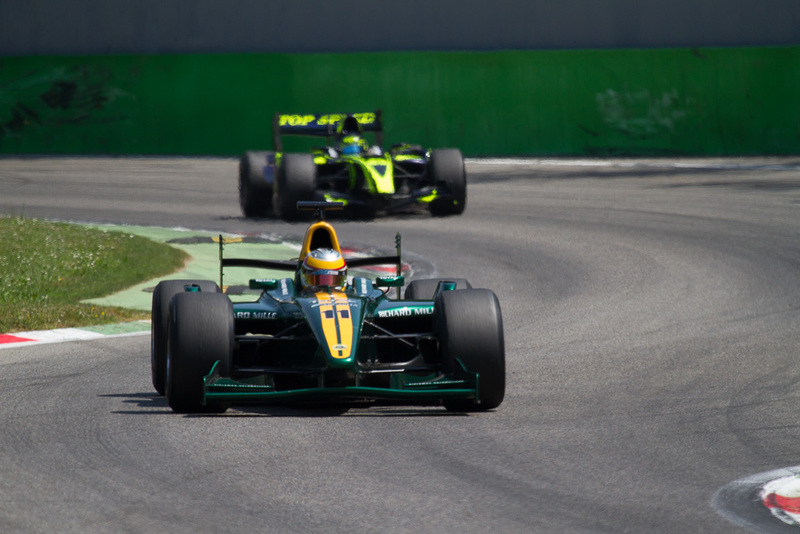 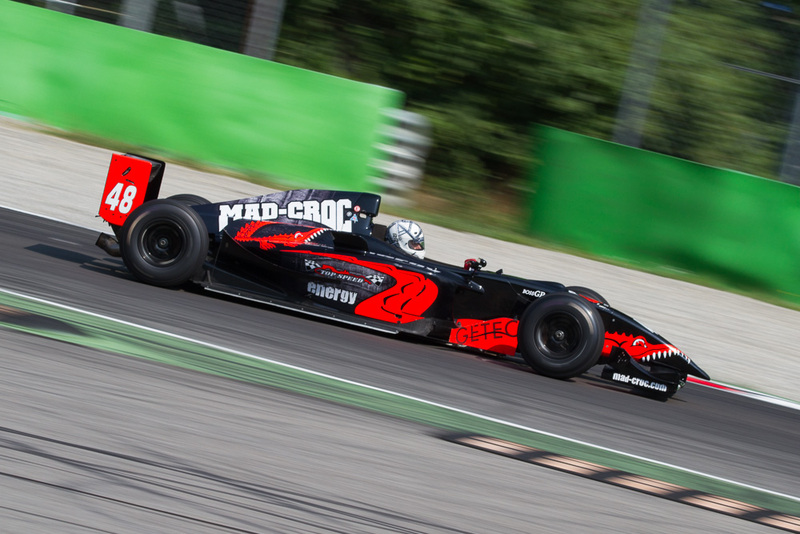 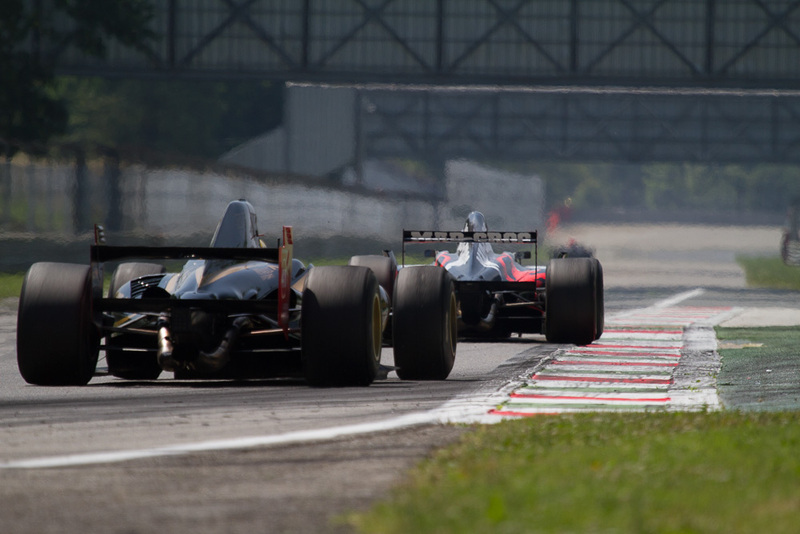 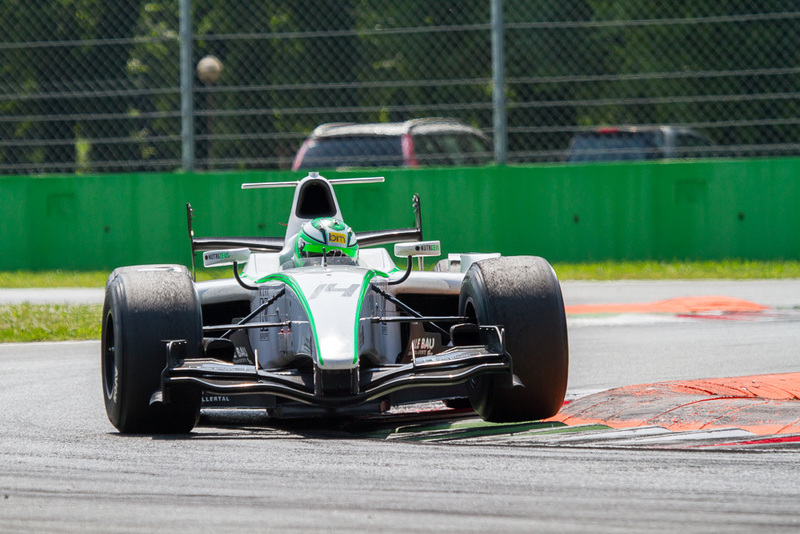 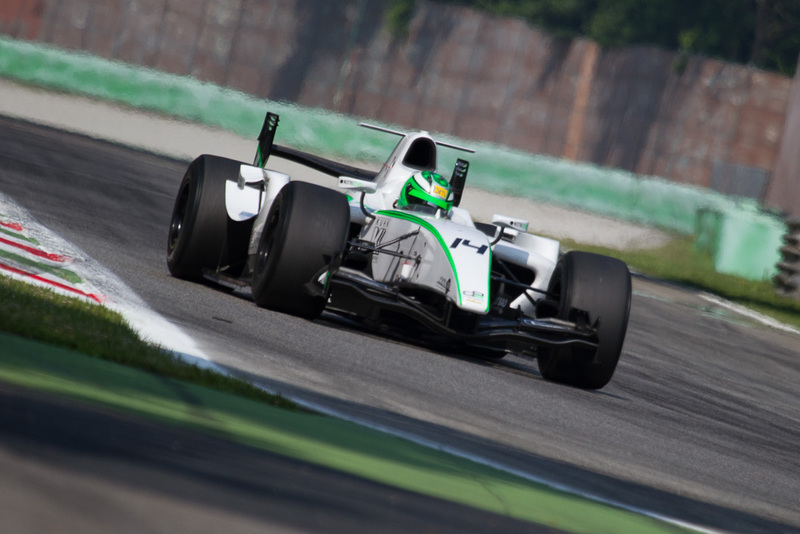 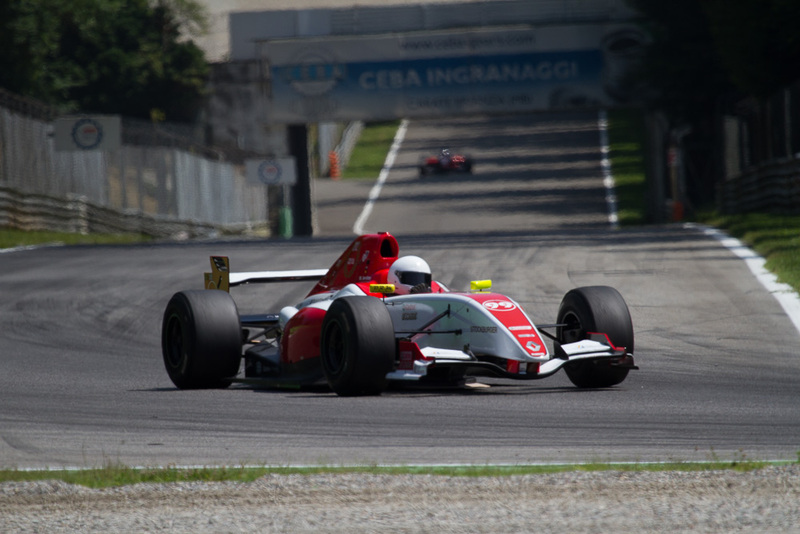 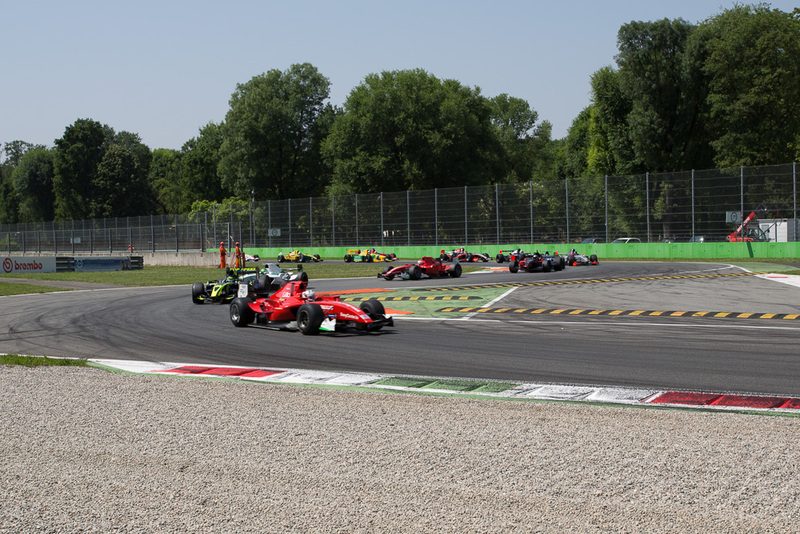 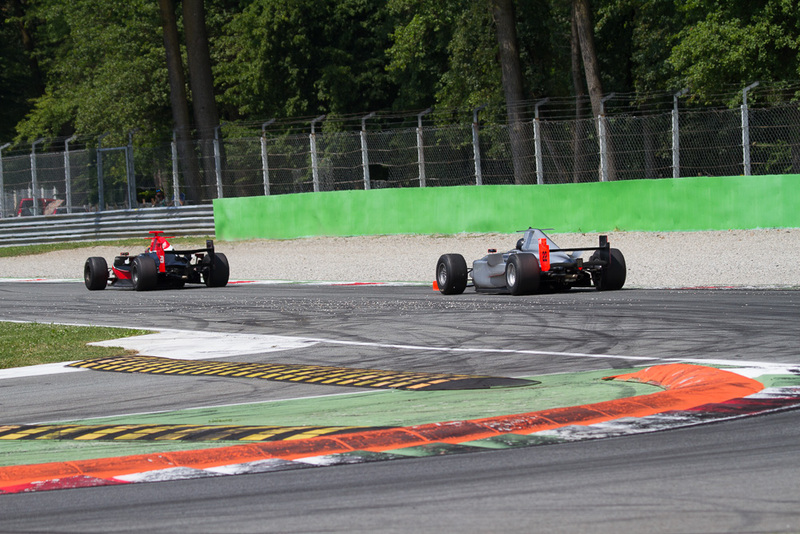 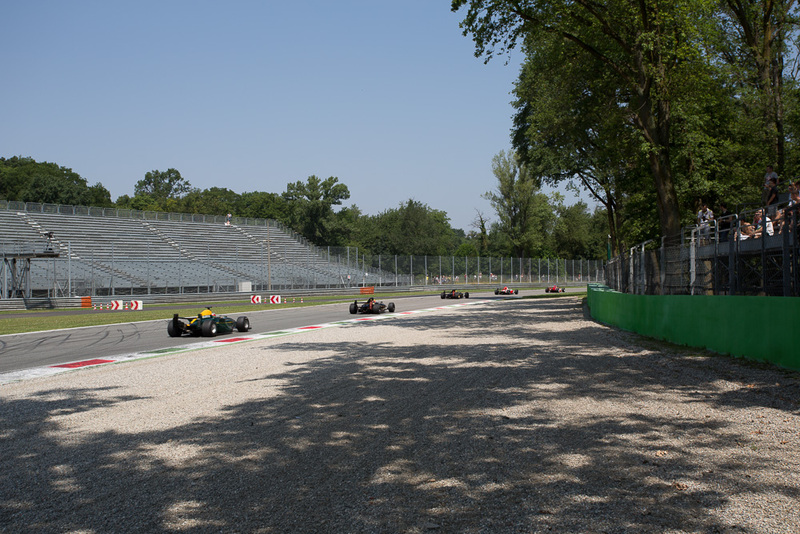 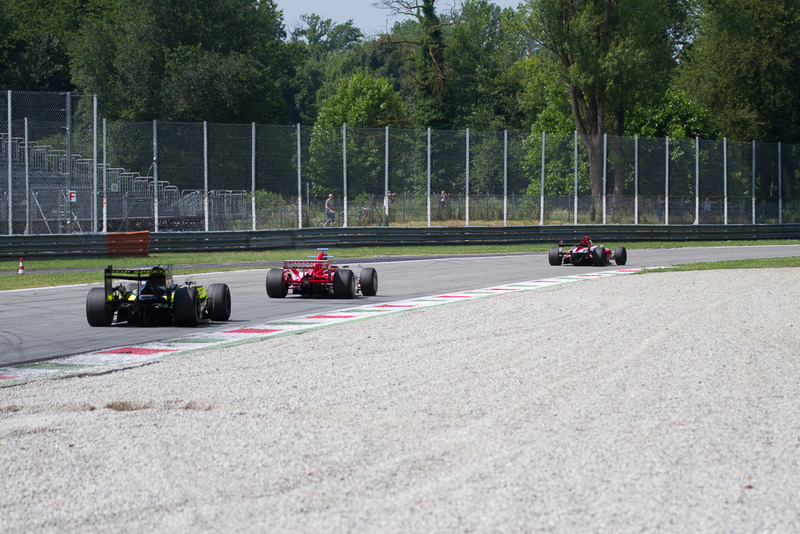 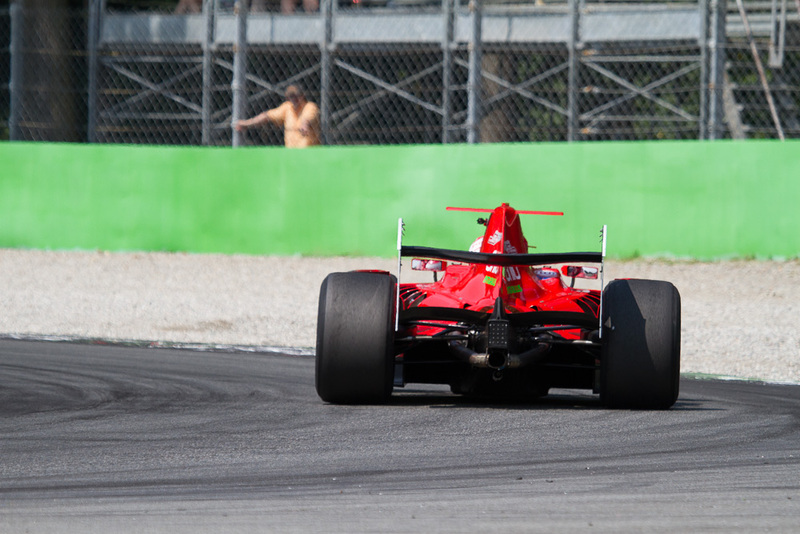 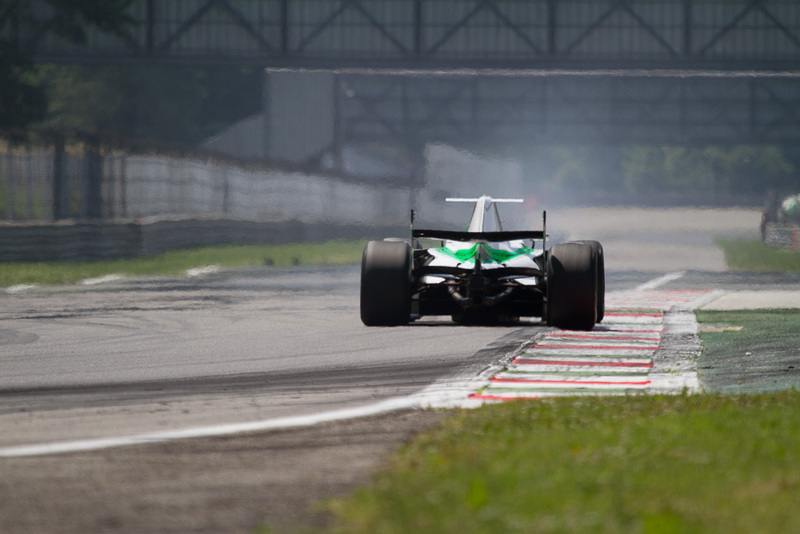 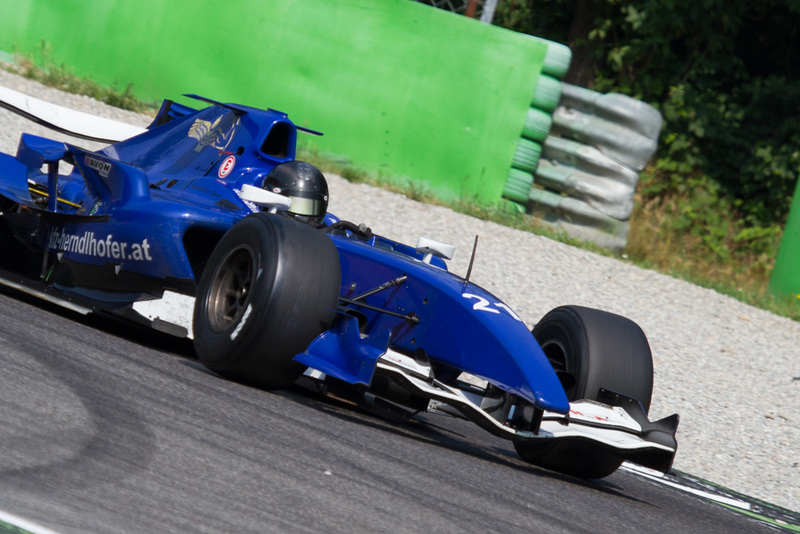 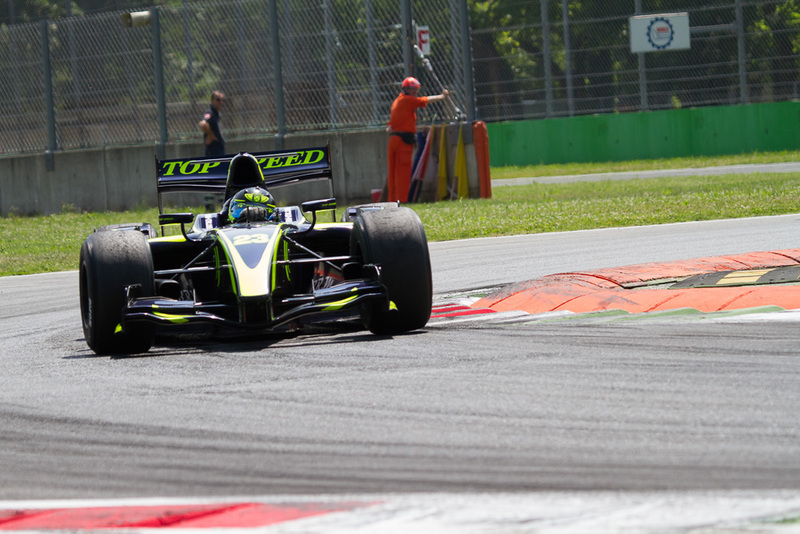 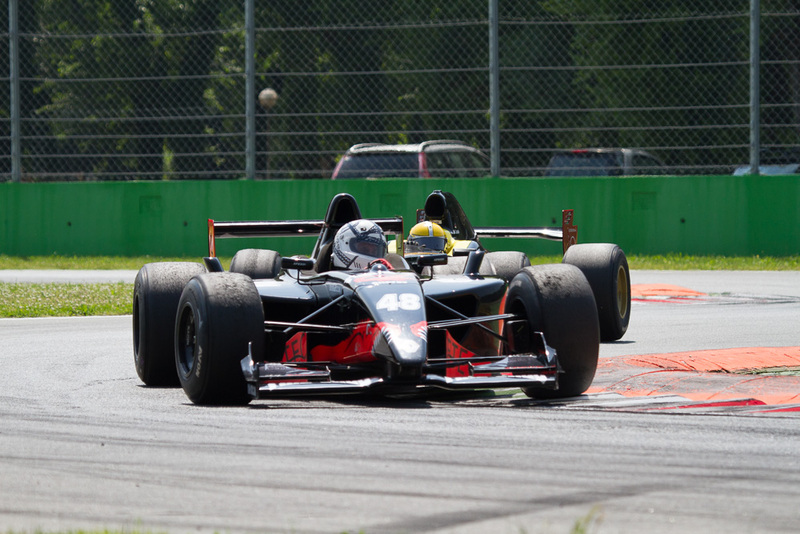 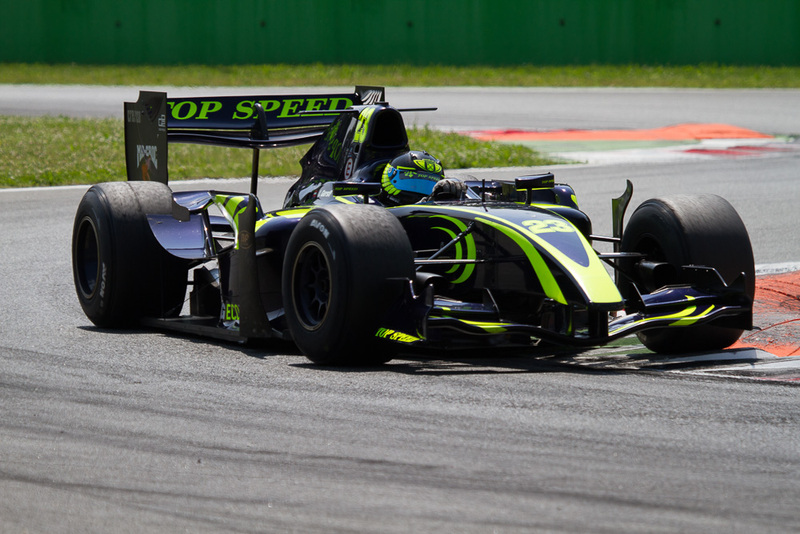 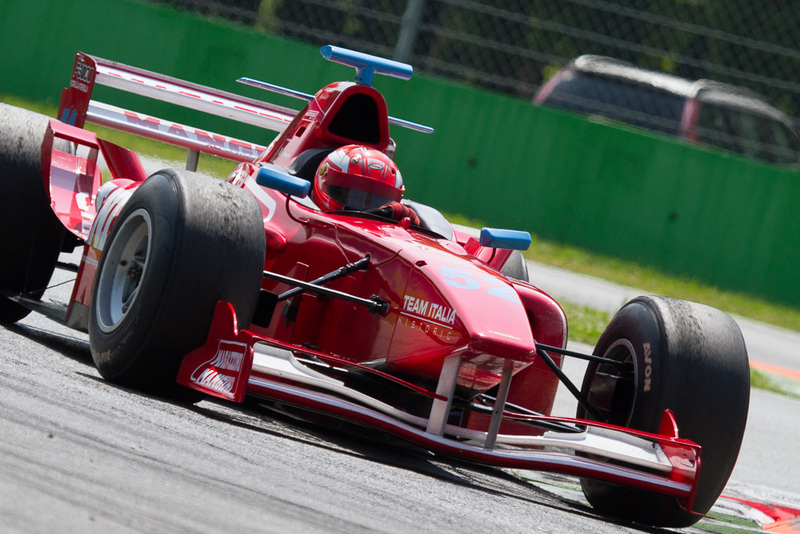 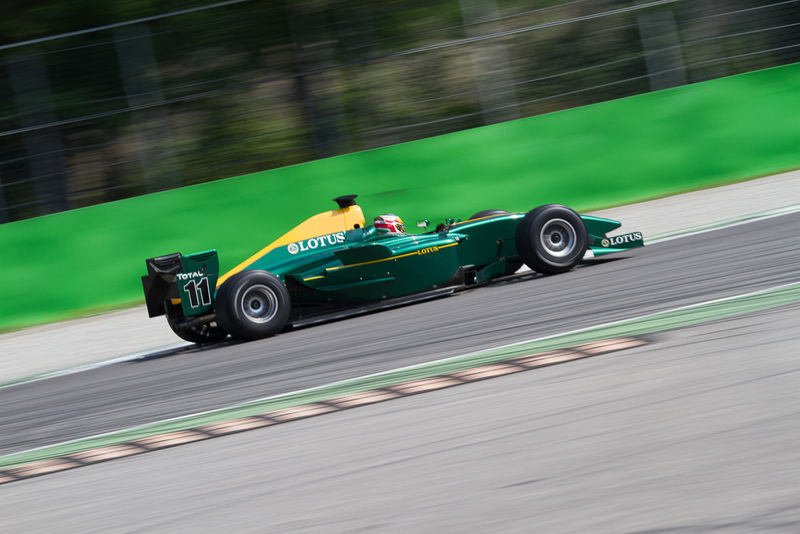 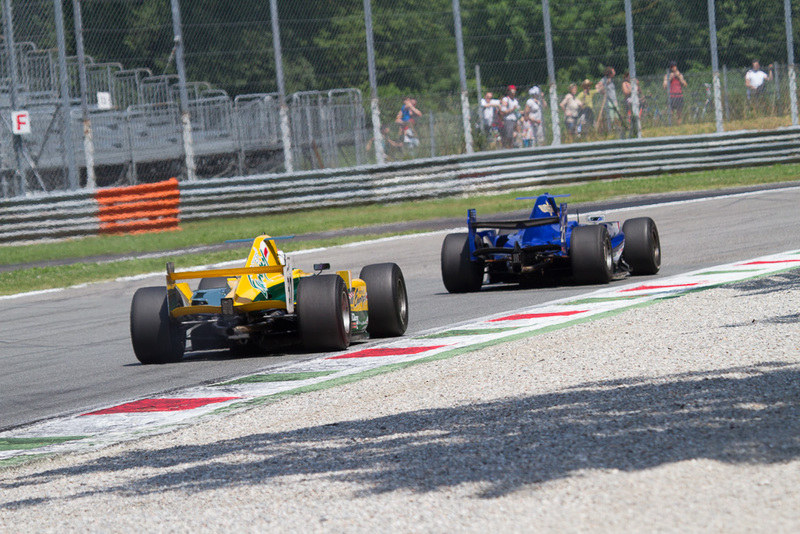 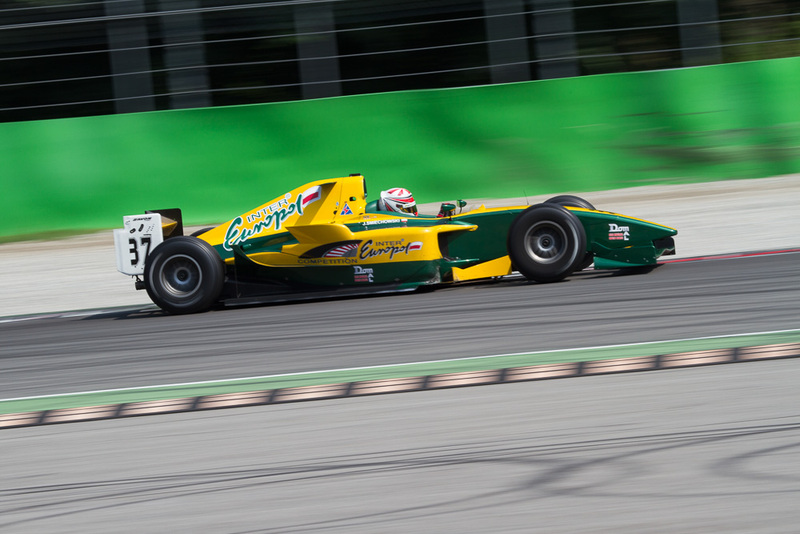 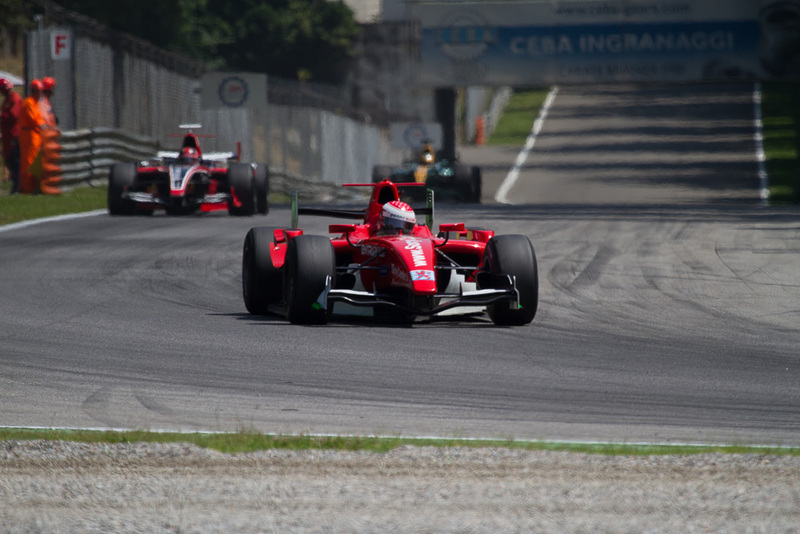 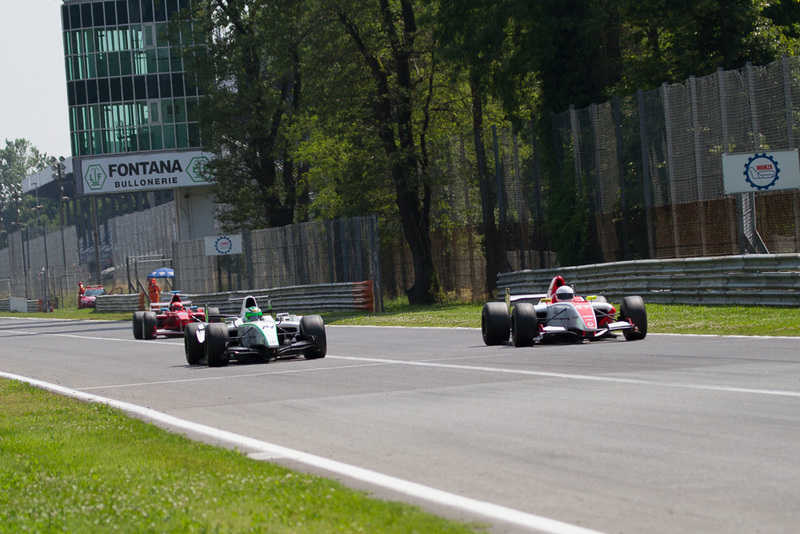 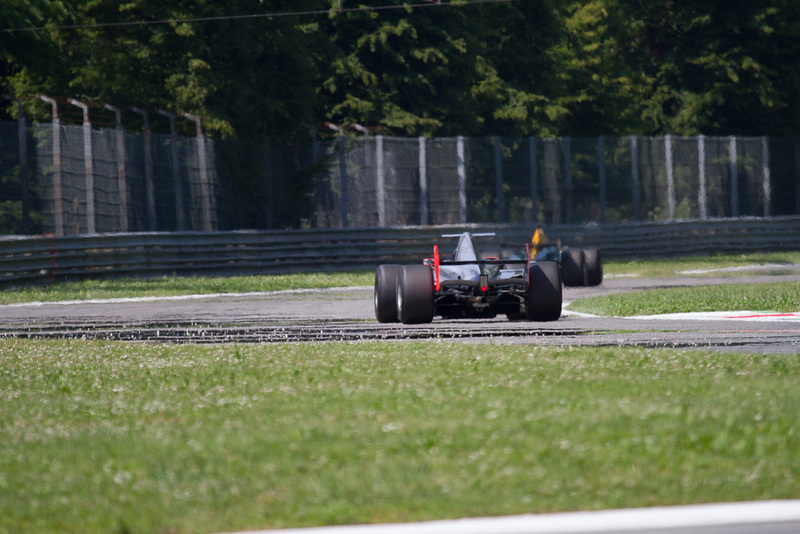 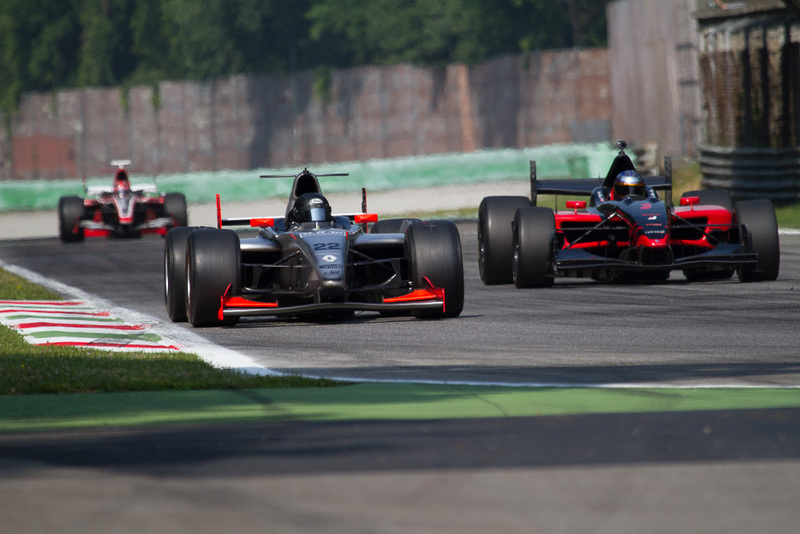 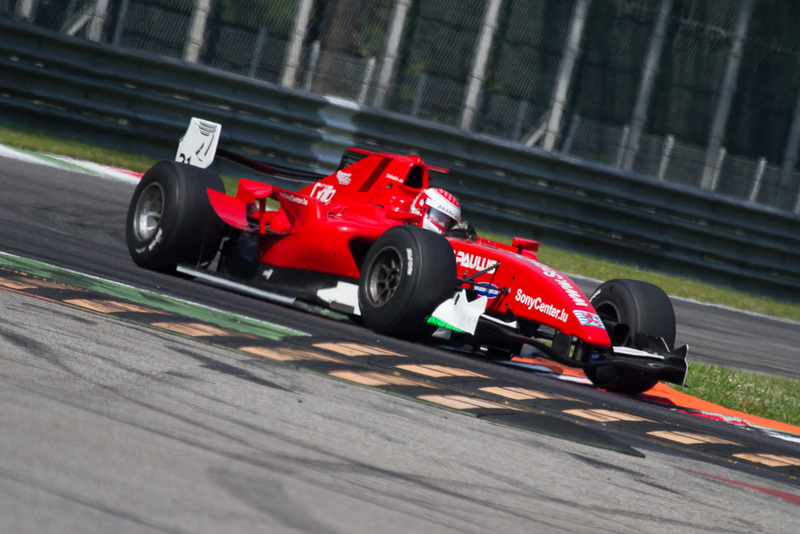 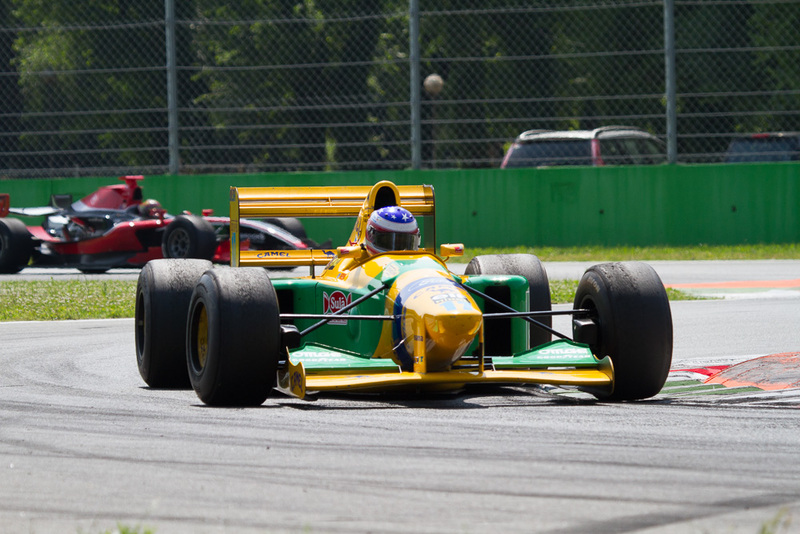 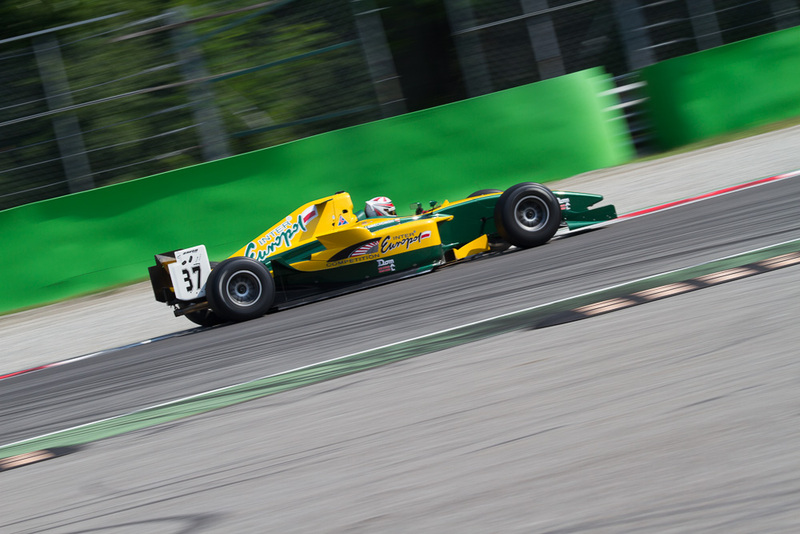 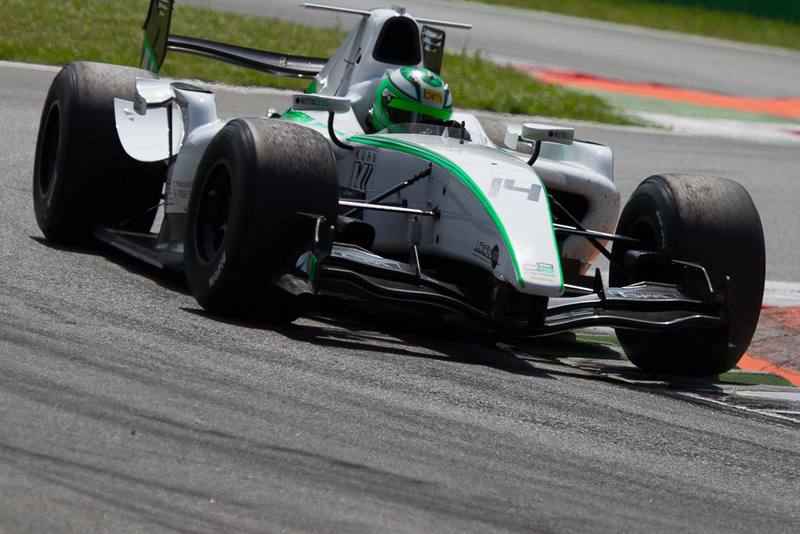 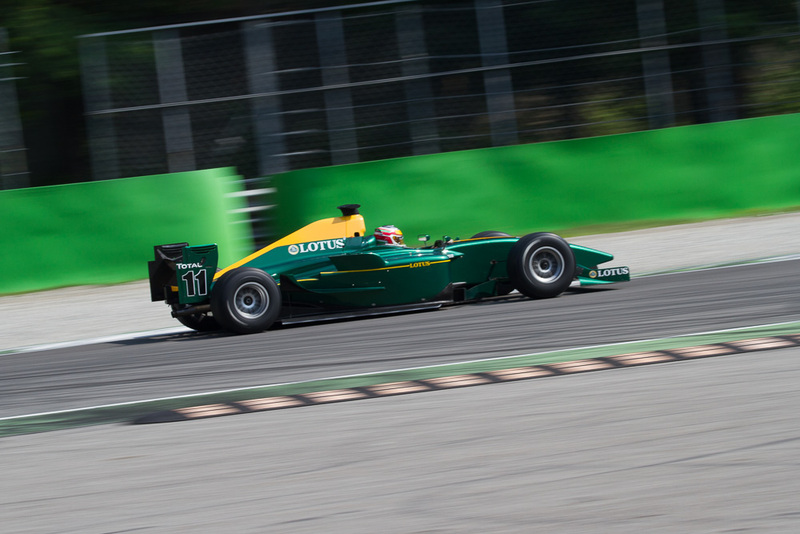 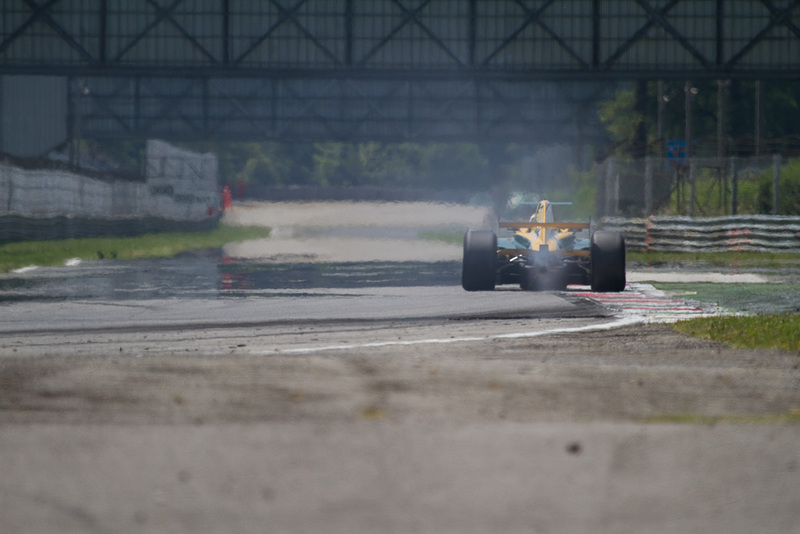 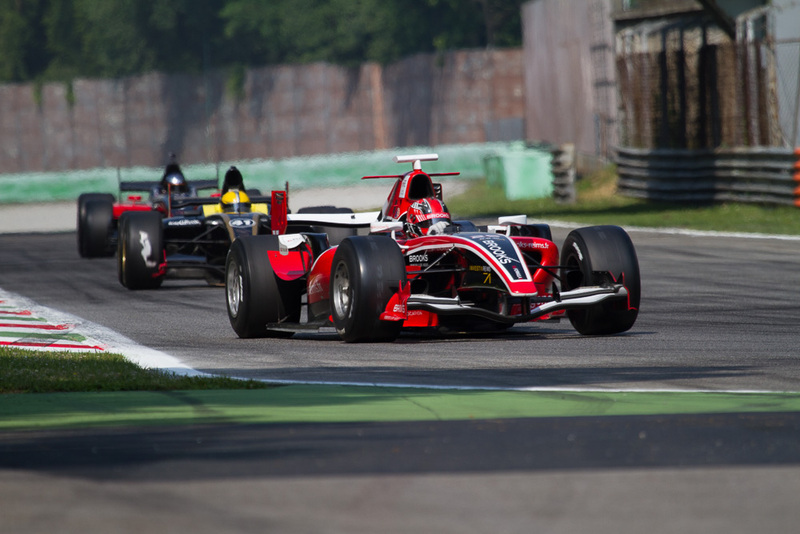 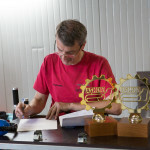 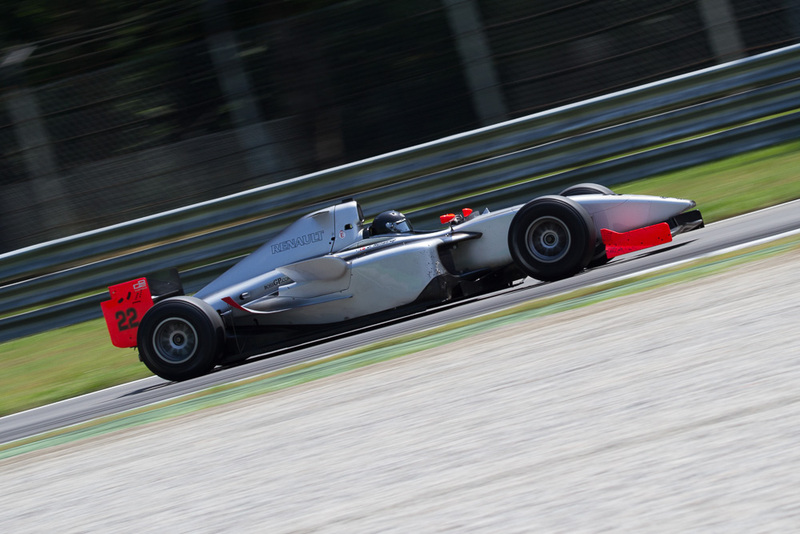 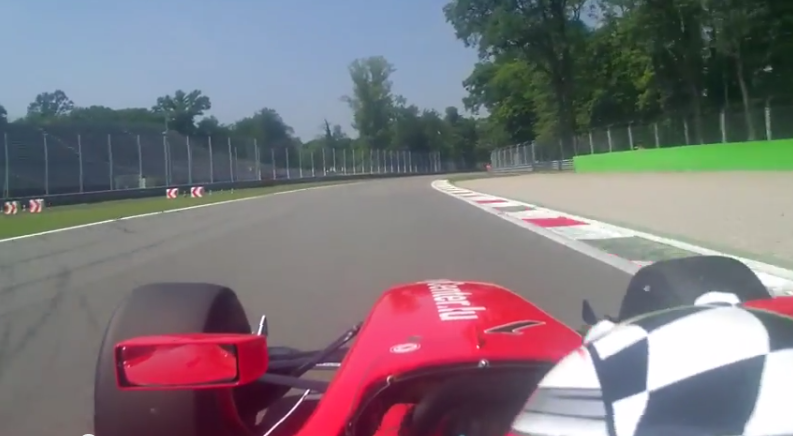 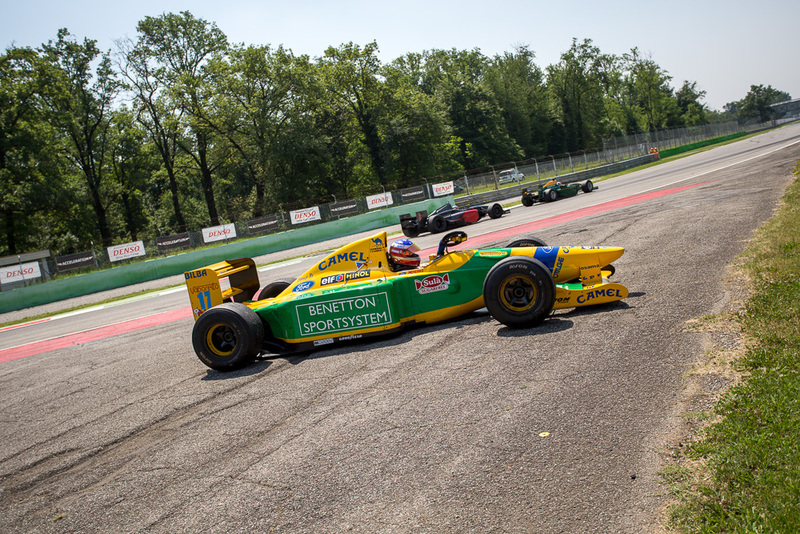 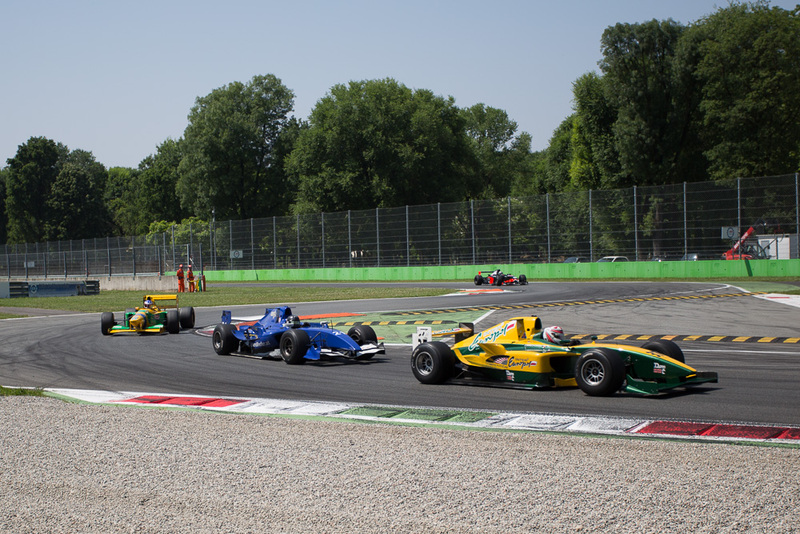 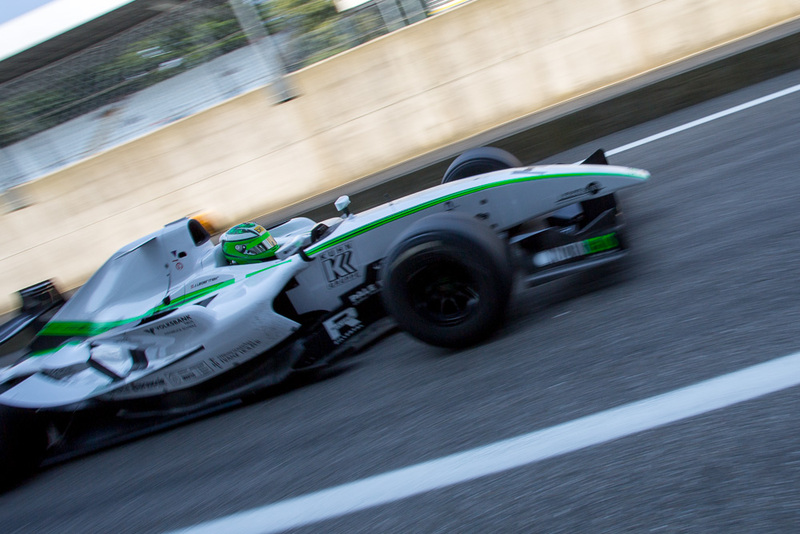 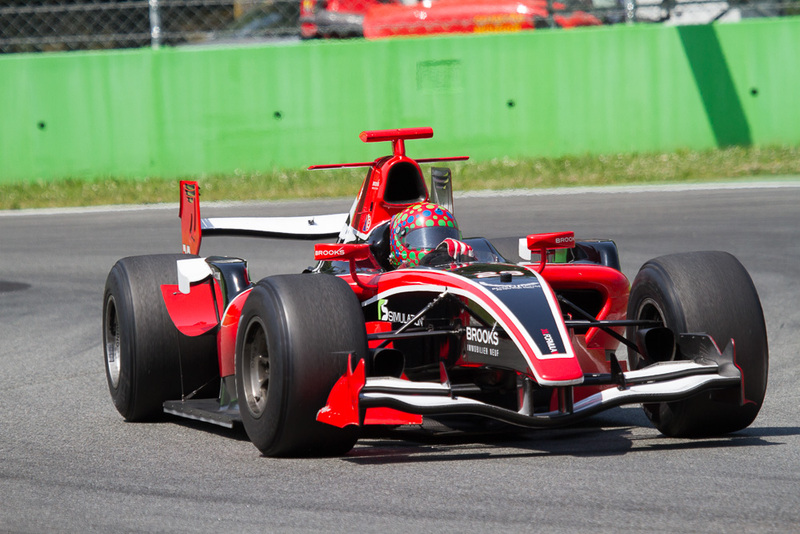 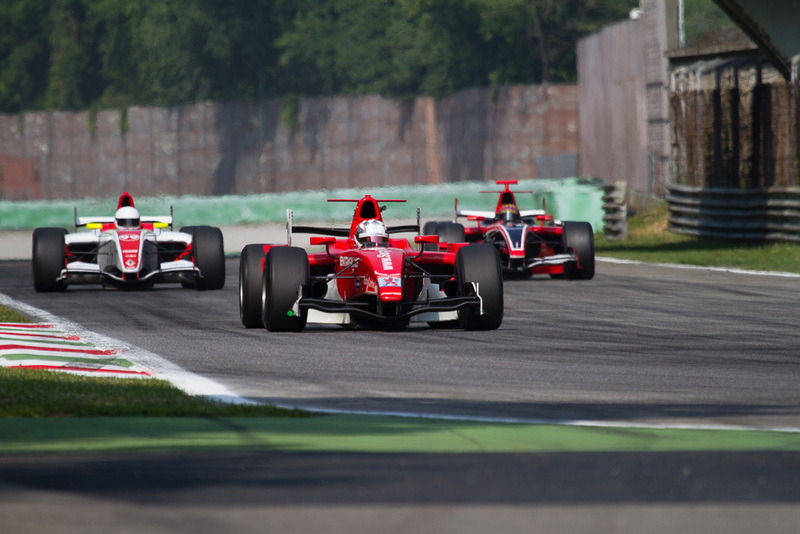 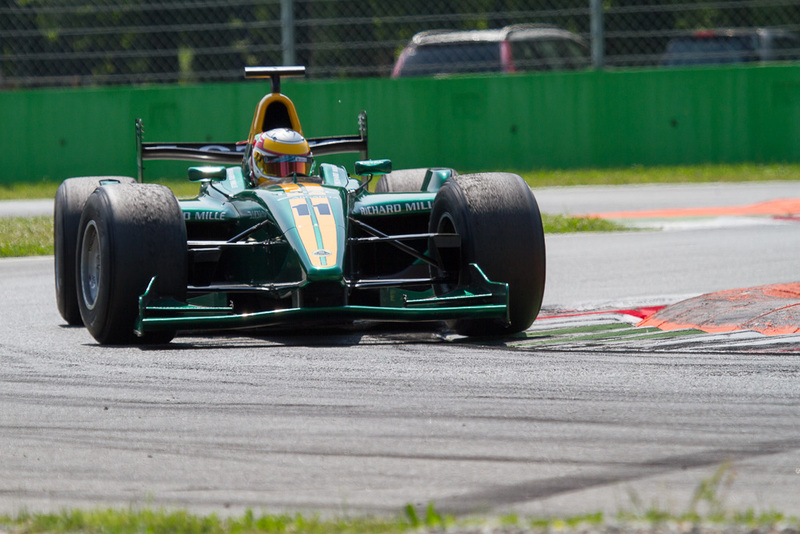 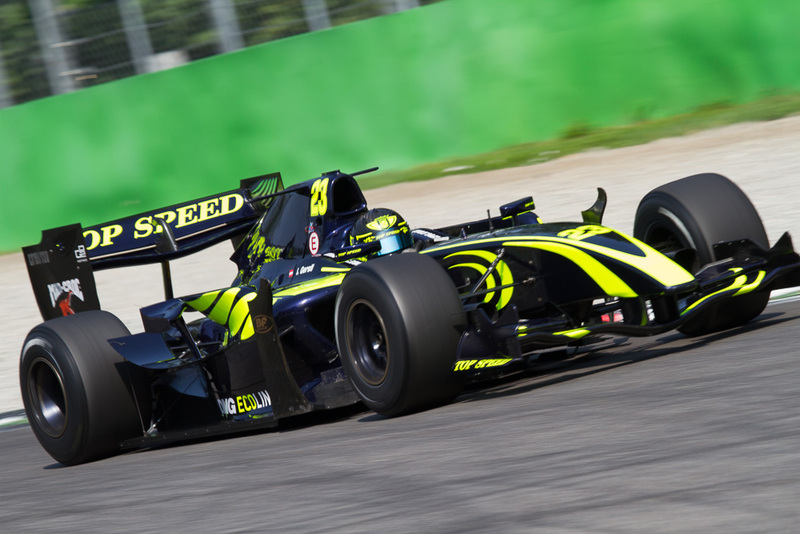 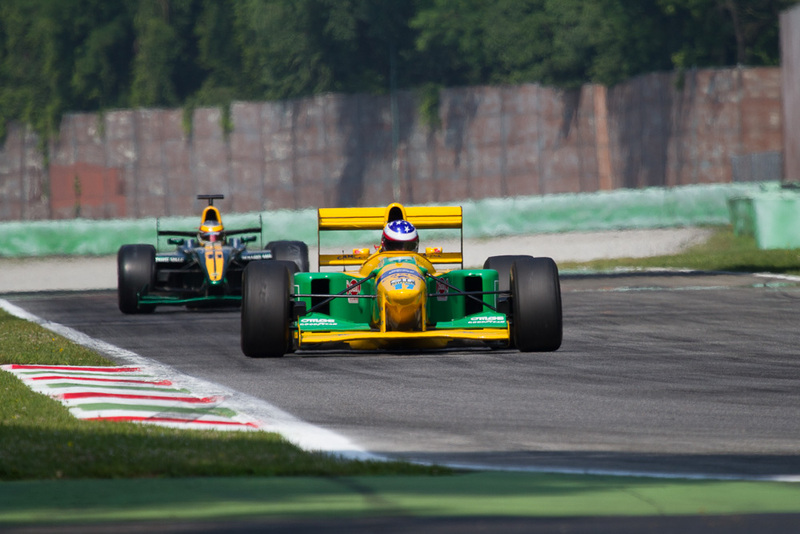 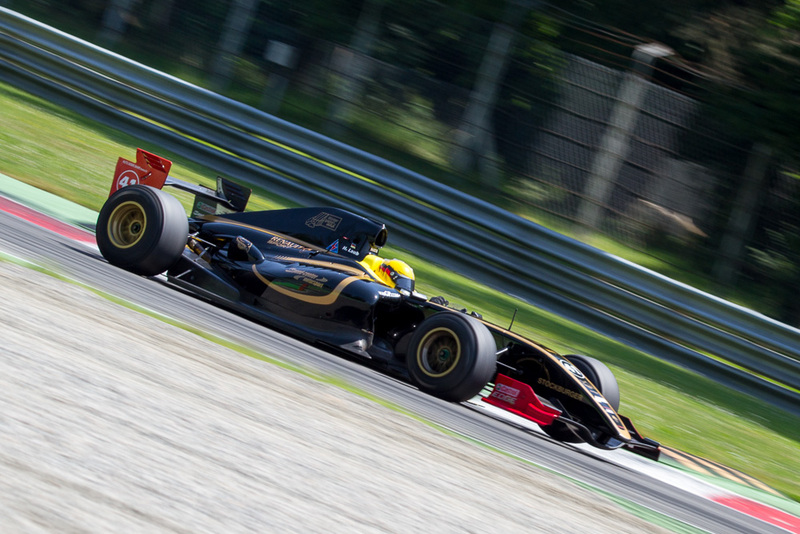 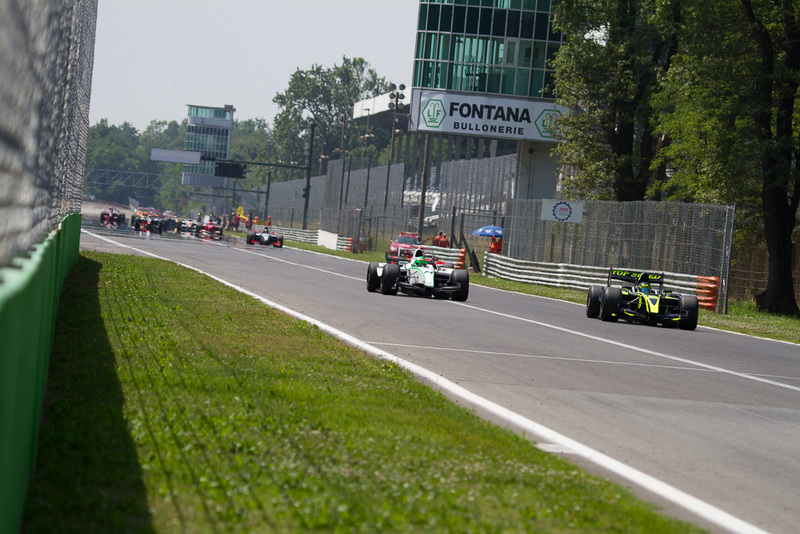 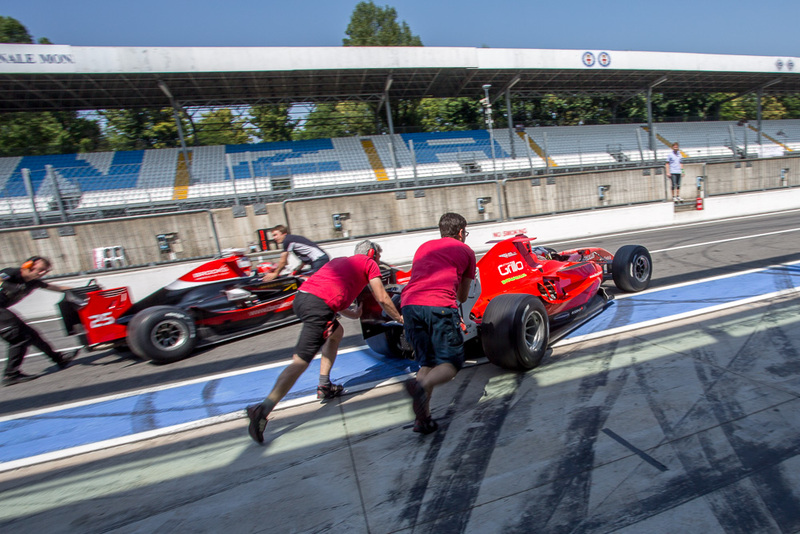 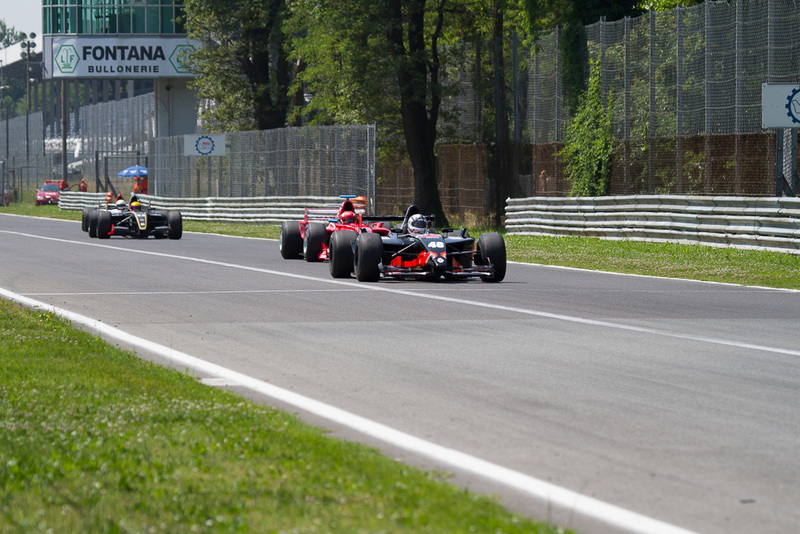 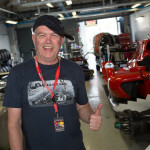 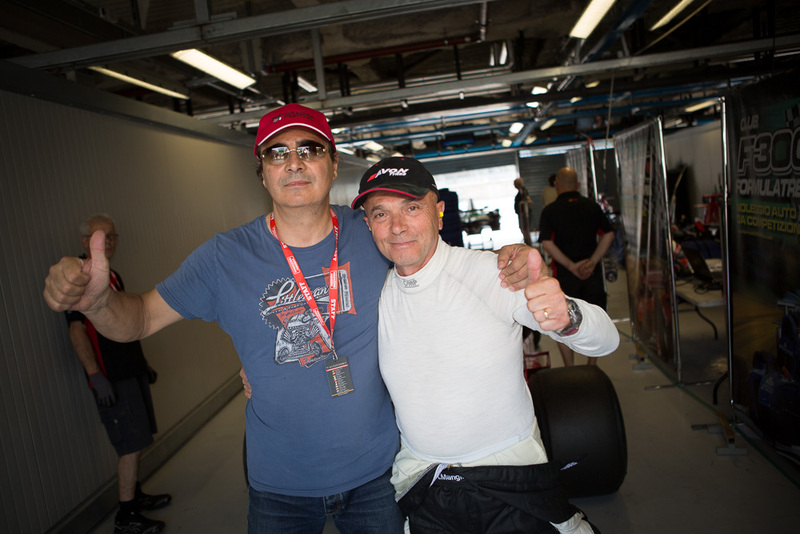 The BOSS GP is back from its annual Grand Prix on the legendary „Autodromo di Monza“ in Italy. 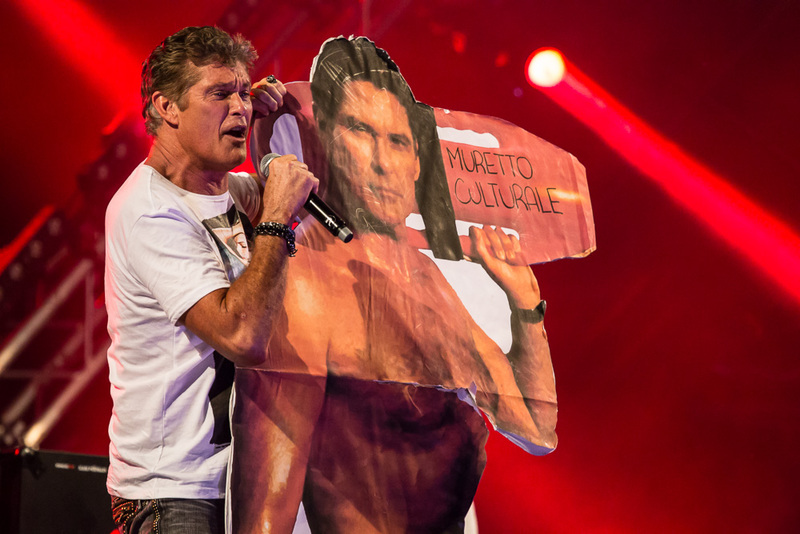 This year’s organizer had something special in his sleeves for fans of 80s and 90s music. 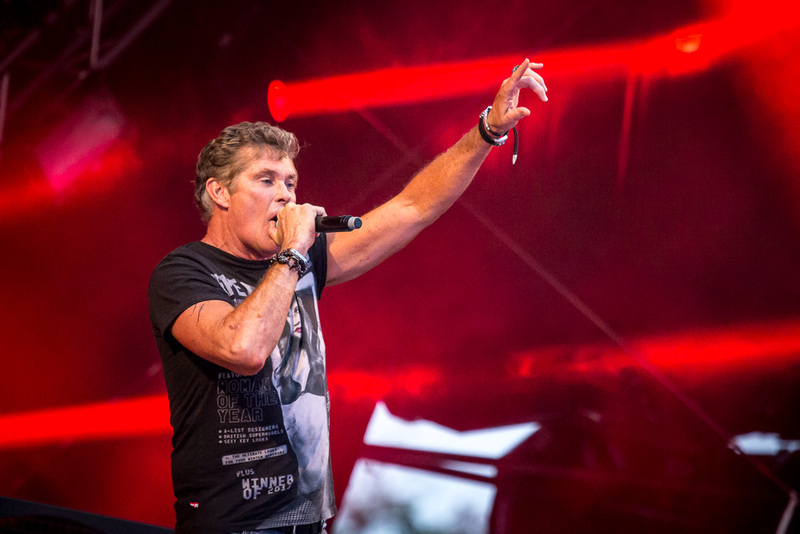 On Friday evening Superstars like David Hasselhoff, Rick Astley, 2Unlimited and more put hundreds of visitors in a good mood. 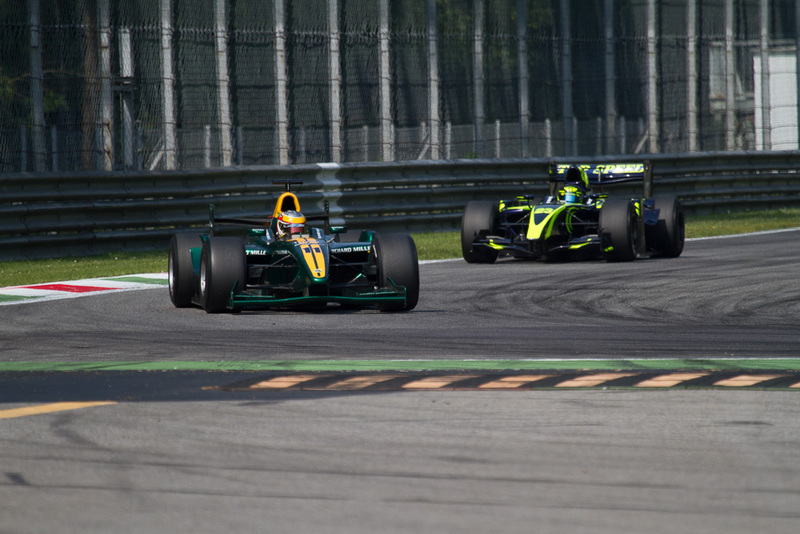 But nevertheless the race event was the center of the focus. 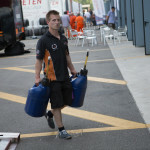 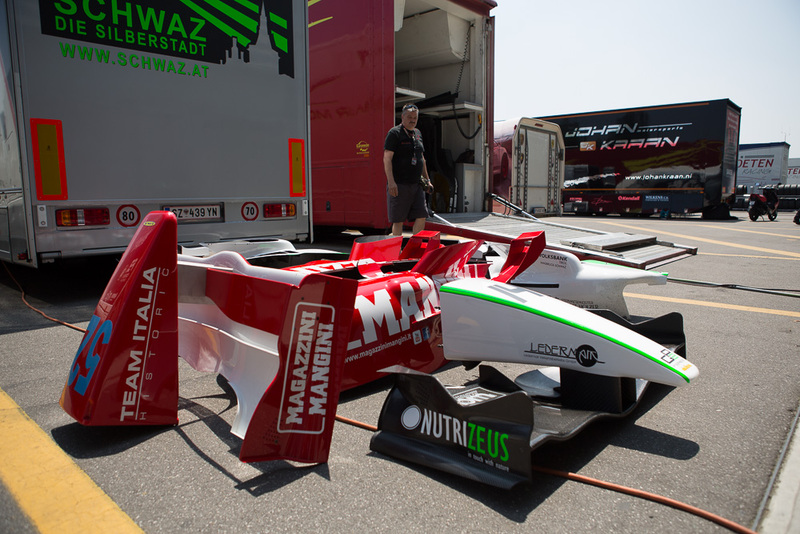 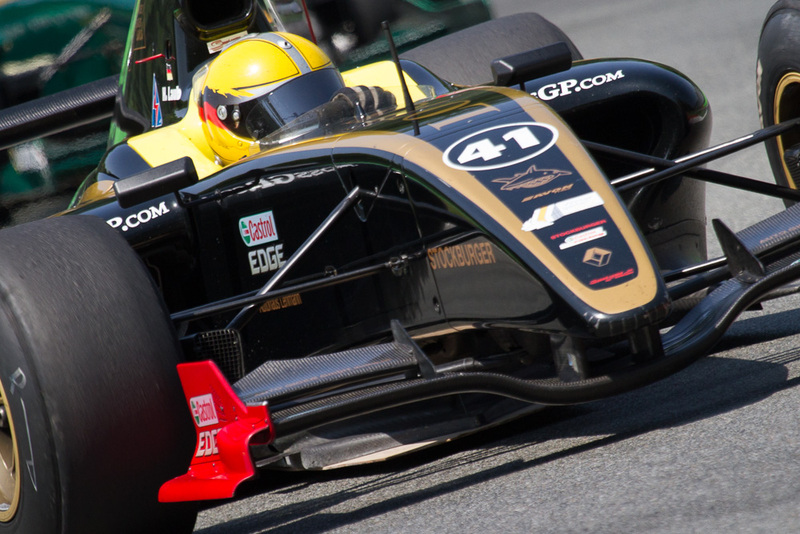 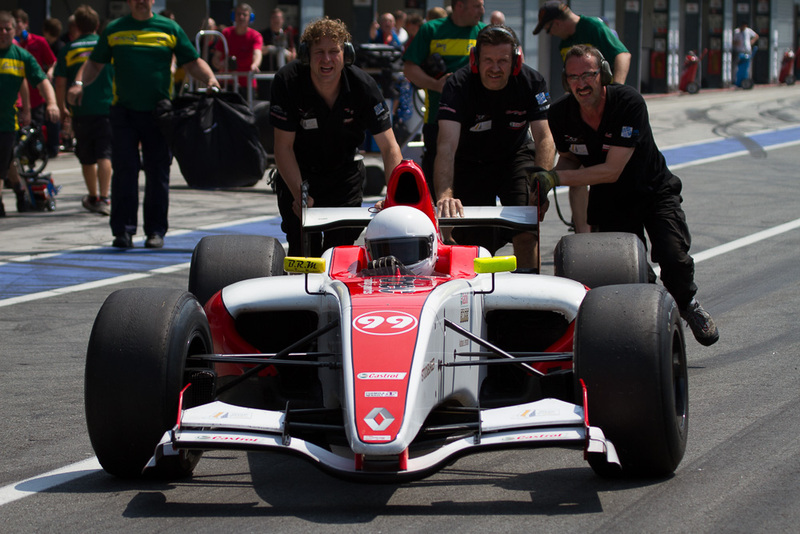 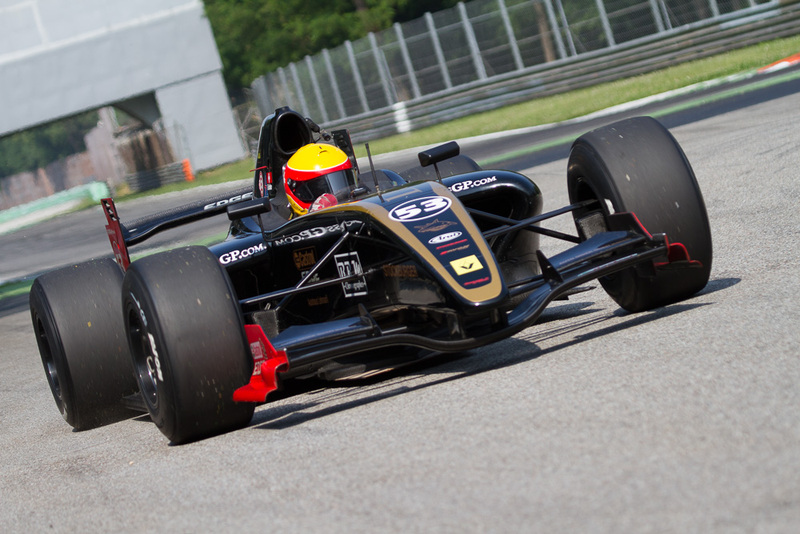 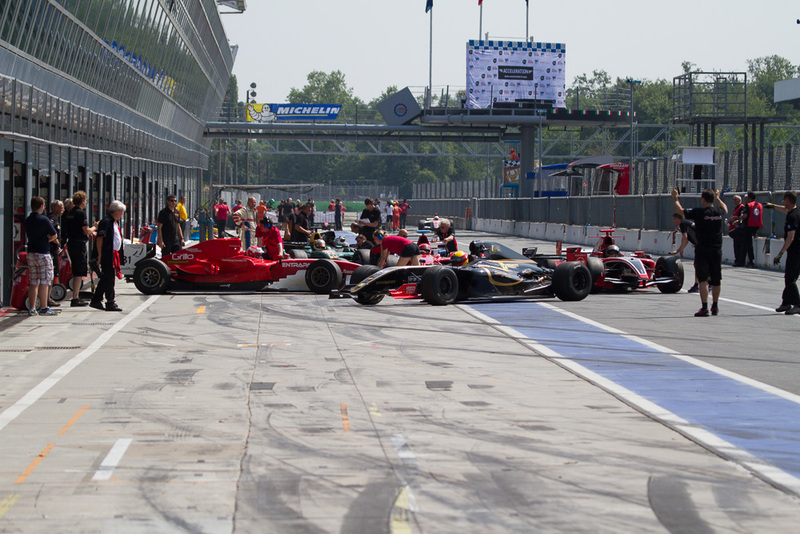 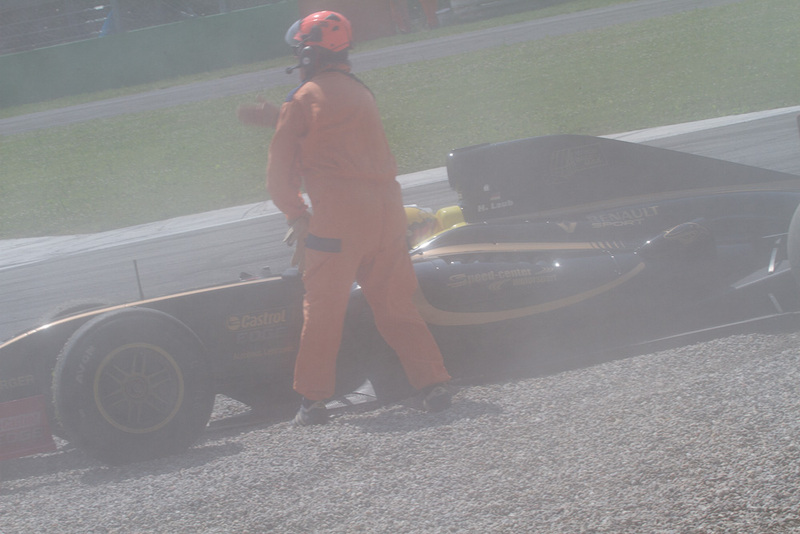 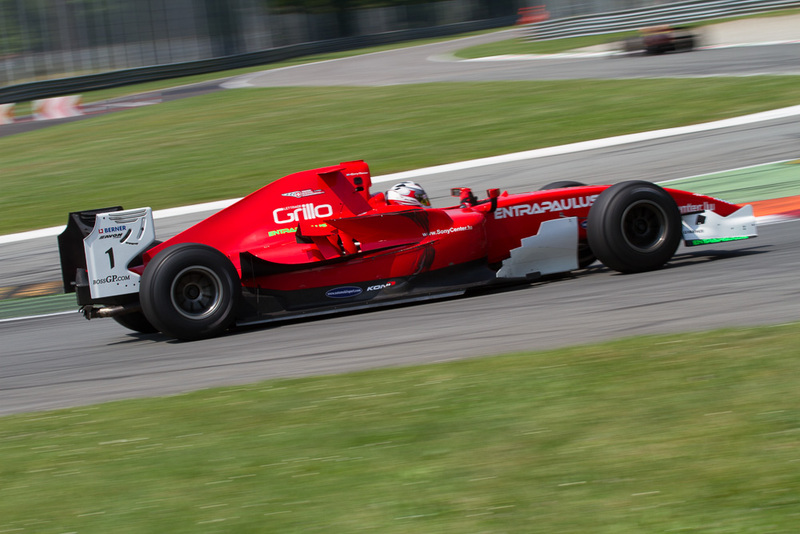 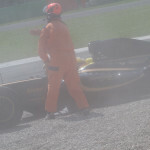 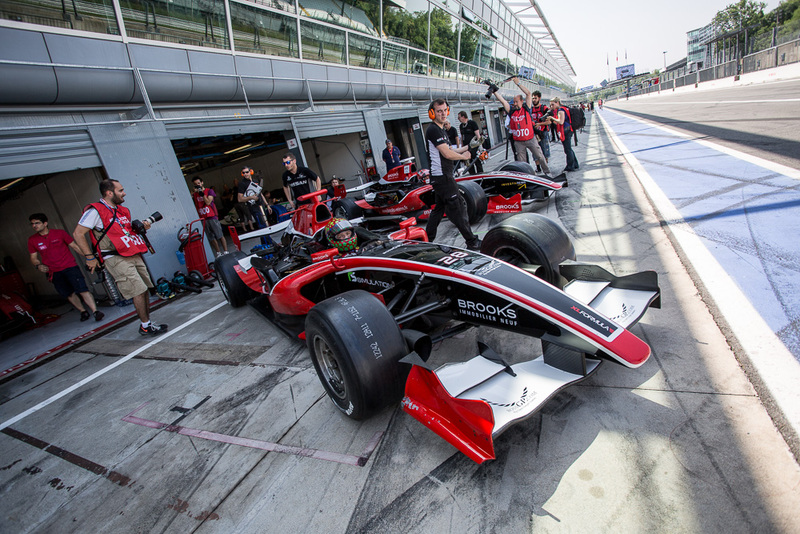 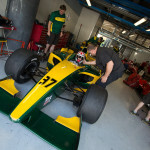 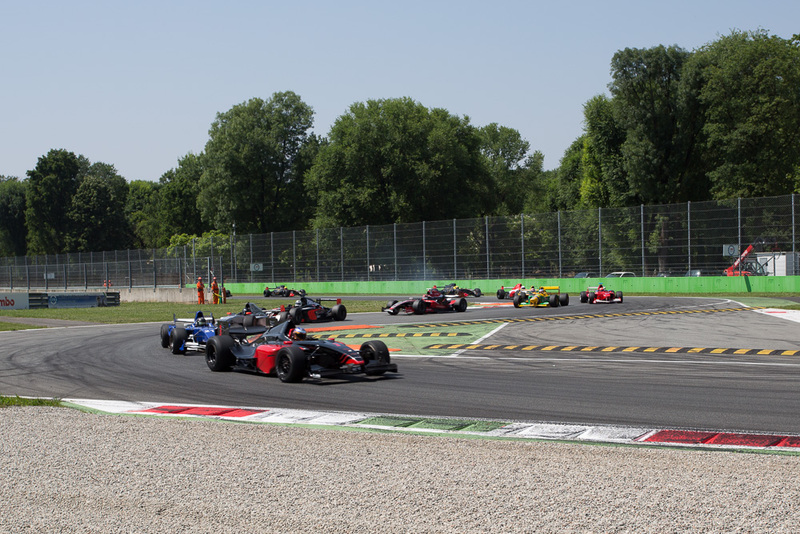 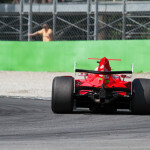 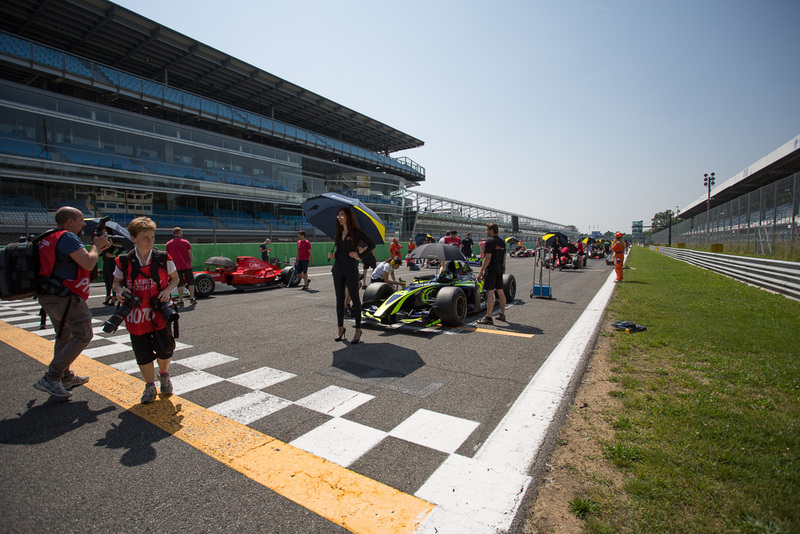 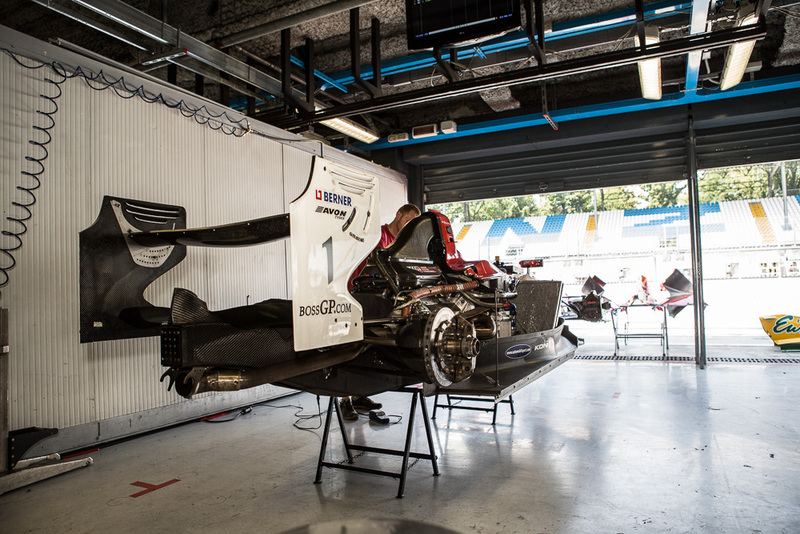 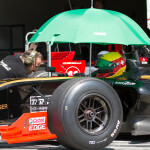 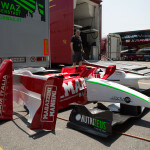 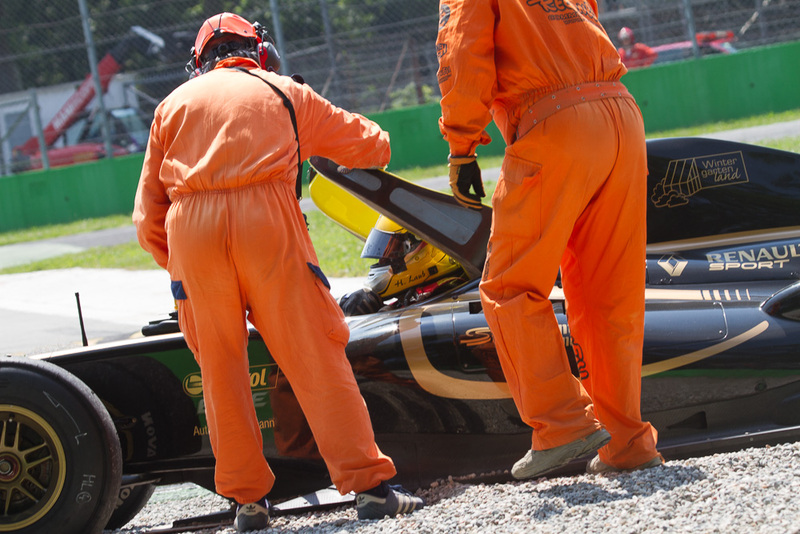 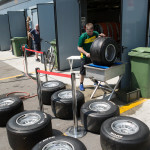 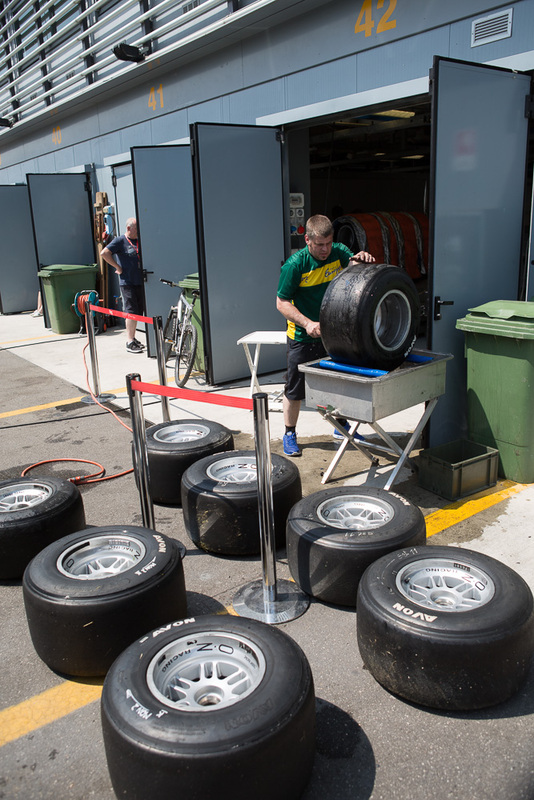 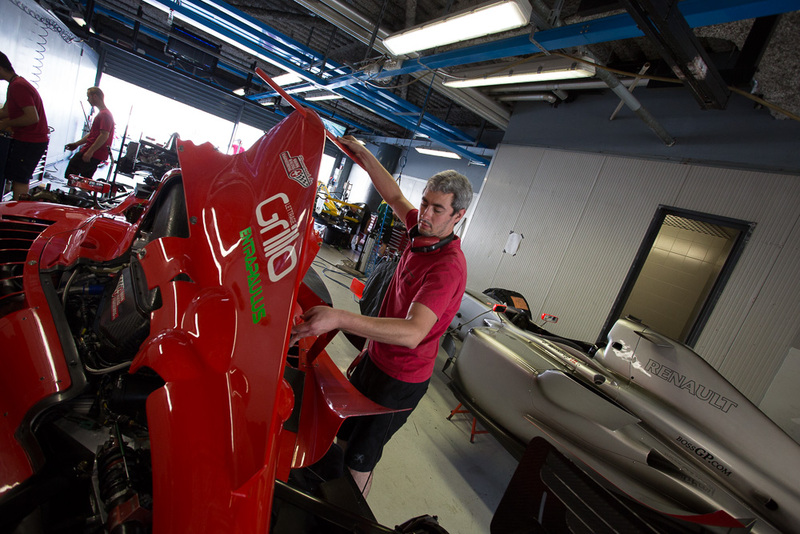 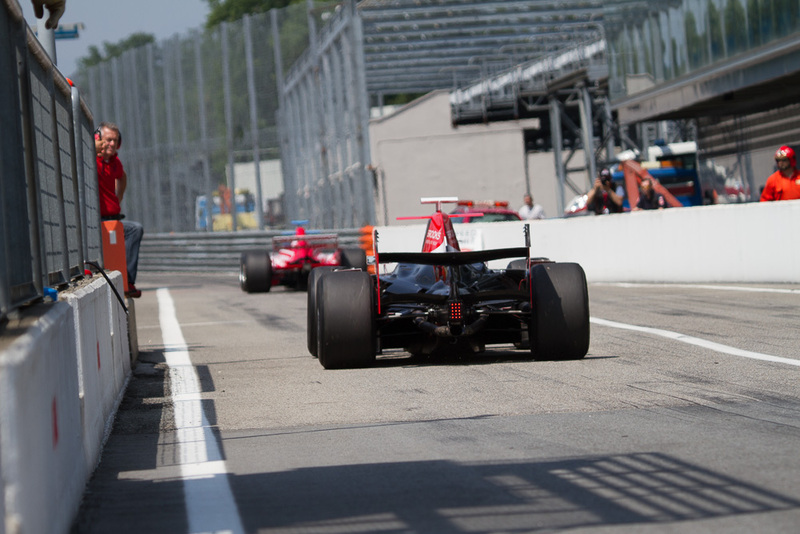 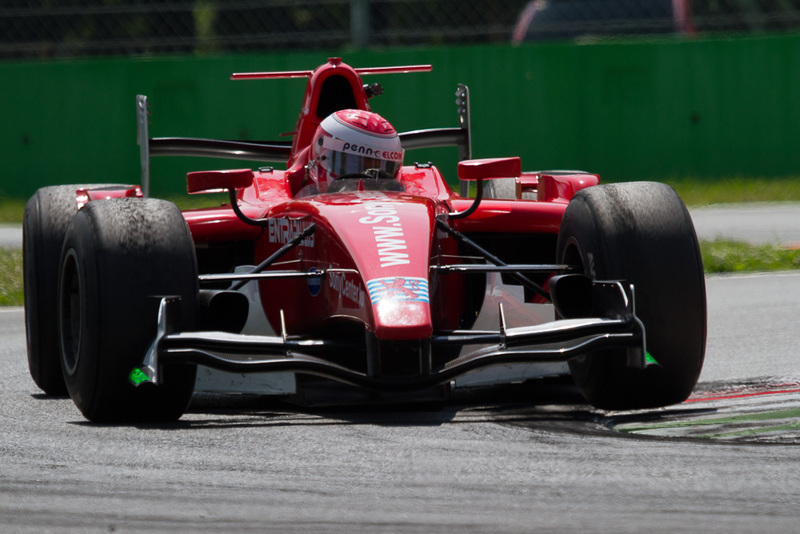 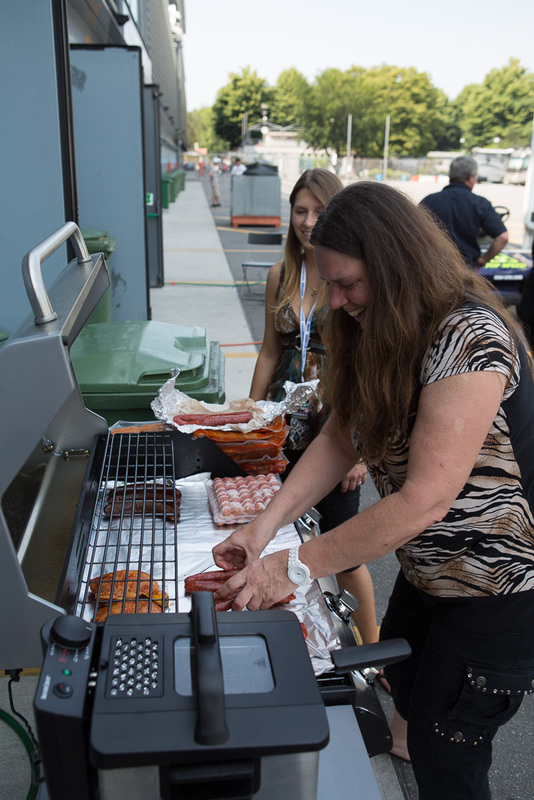 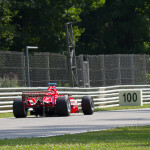 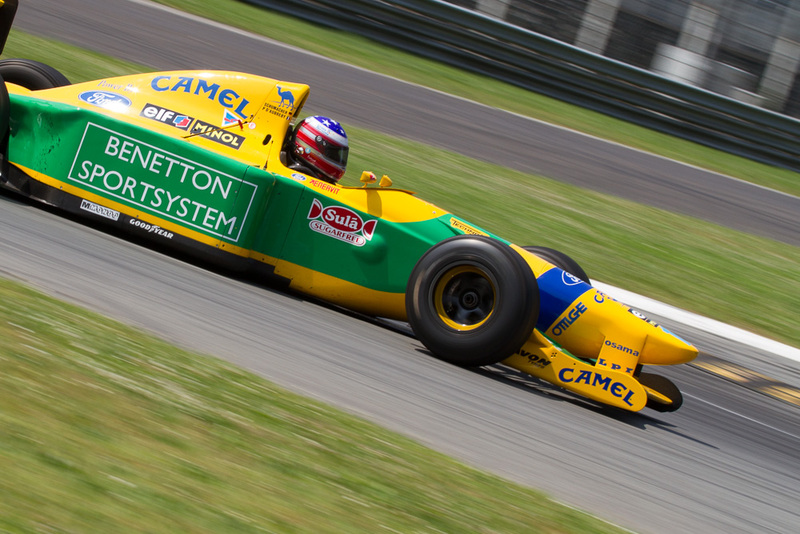 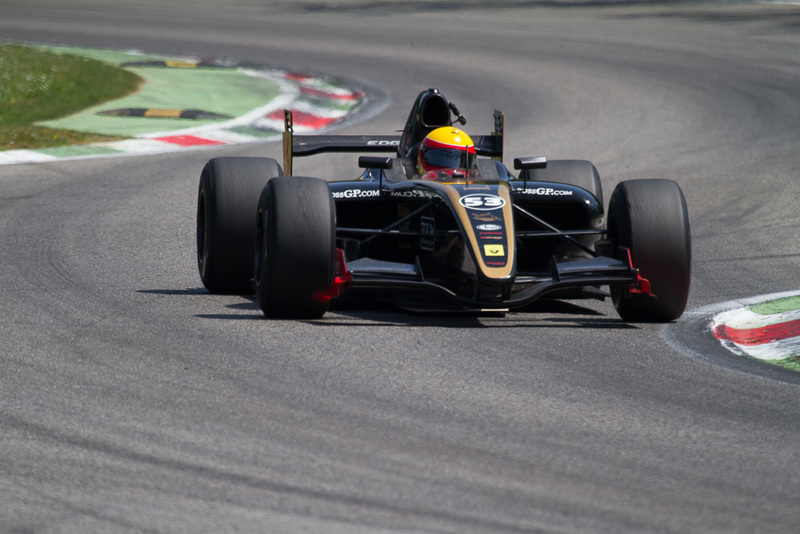 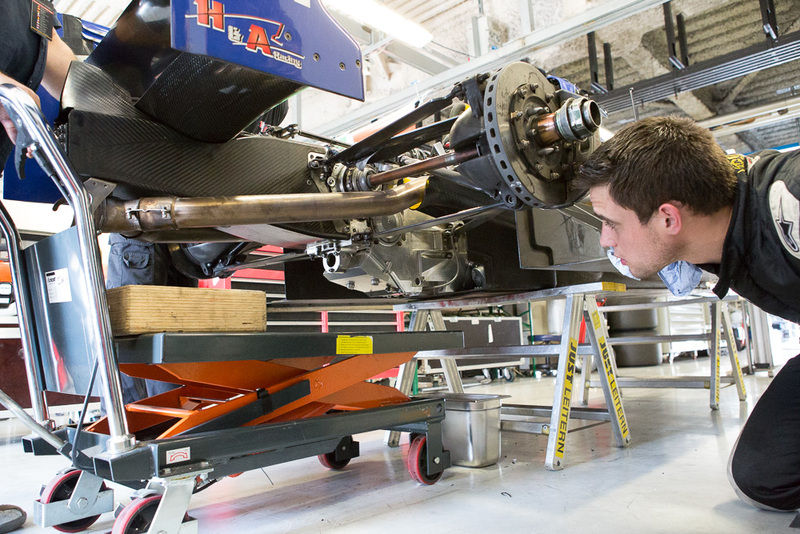 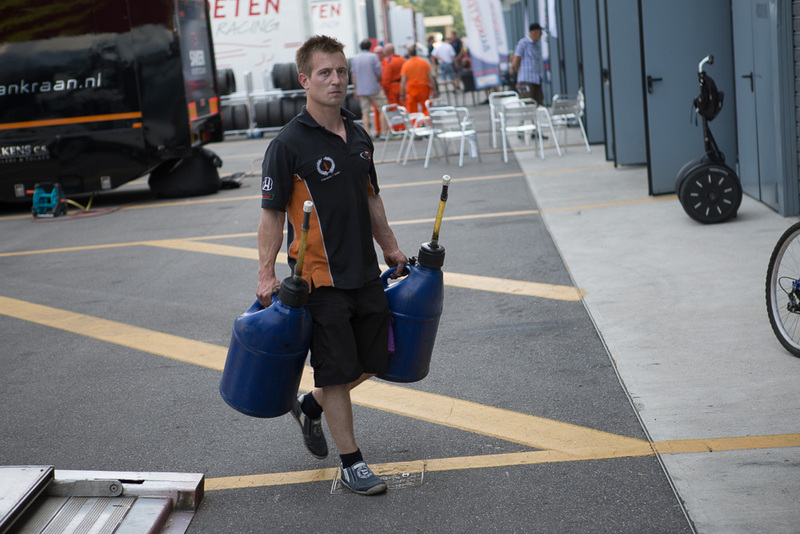 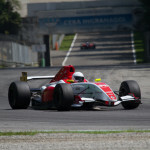 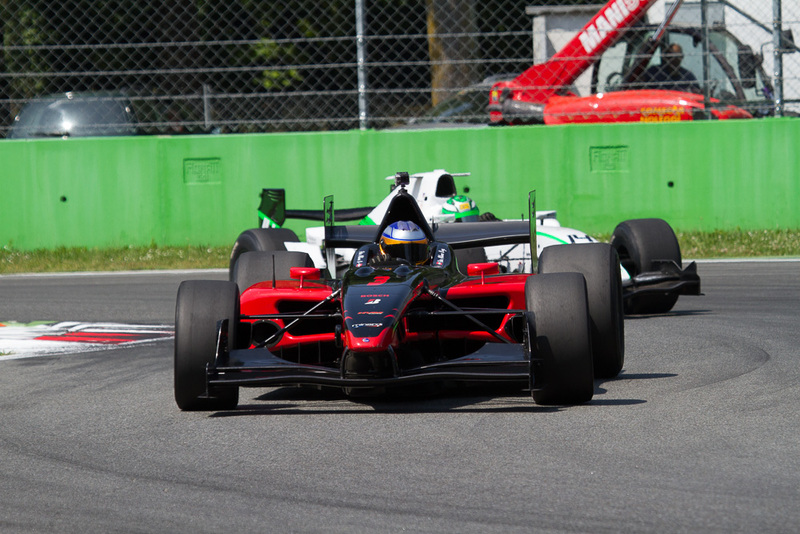 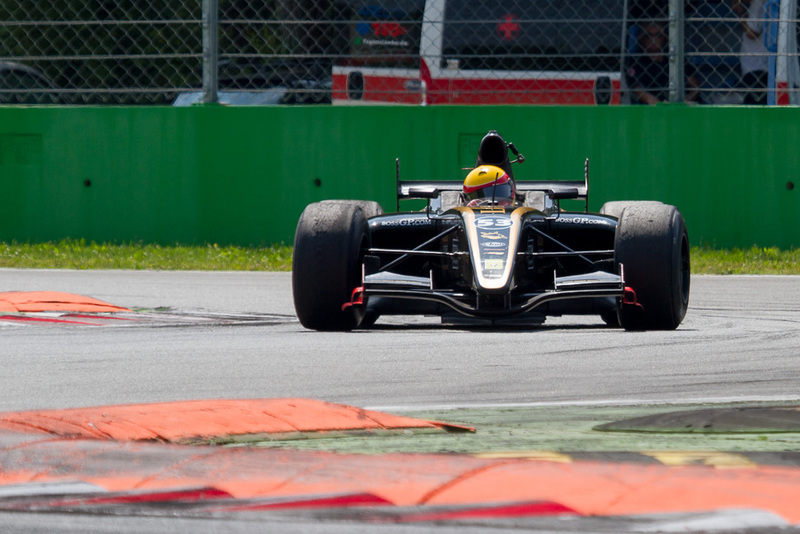 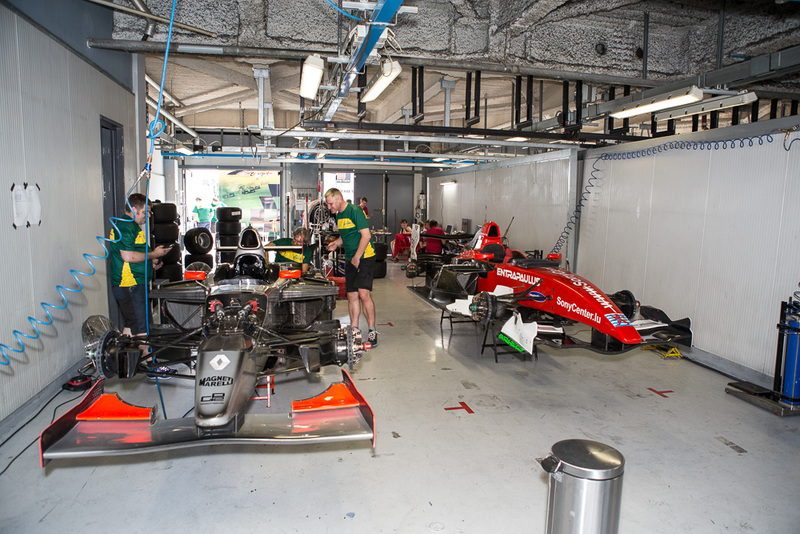 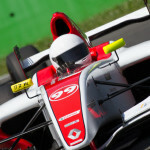 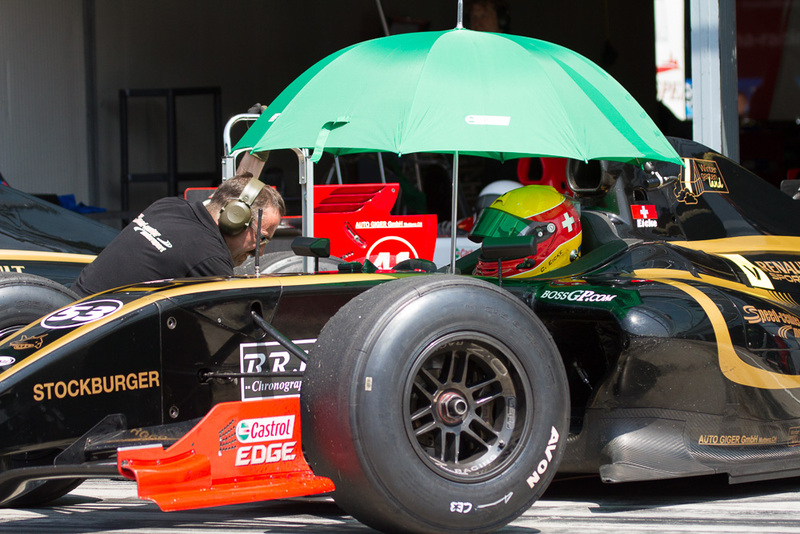 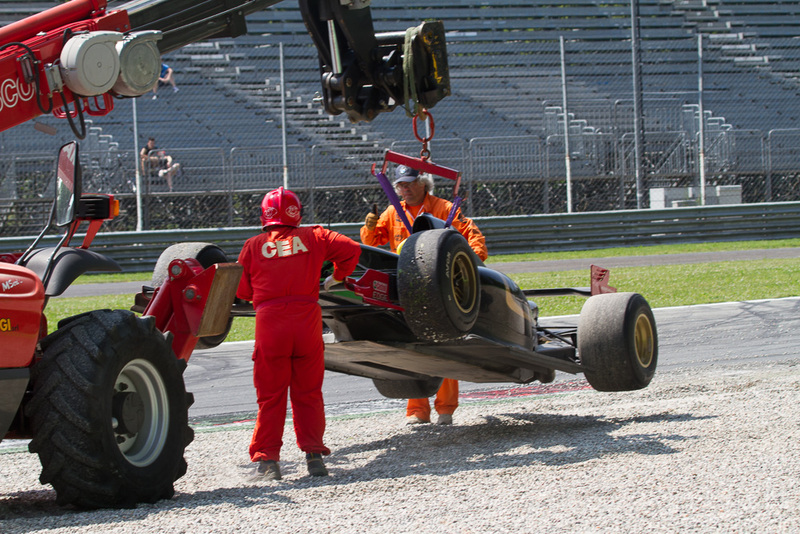 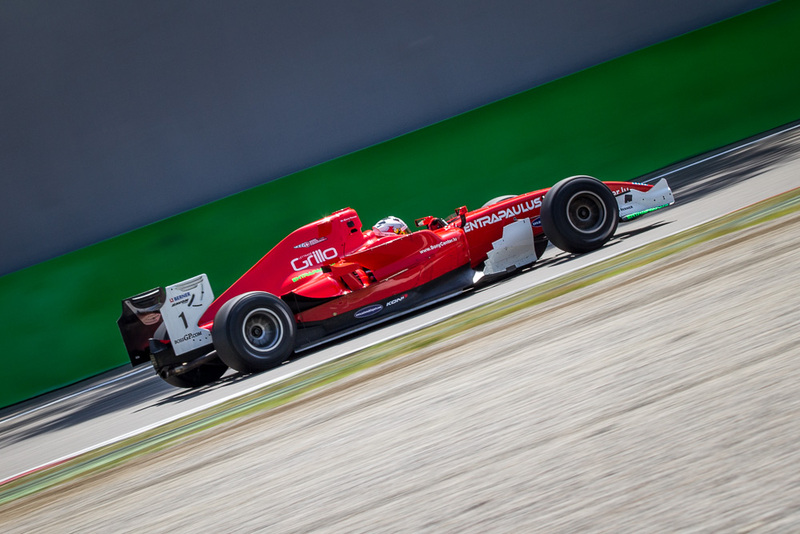 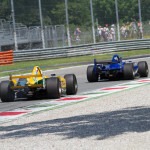 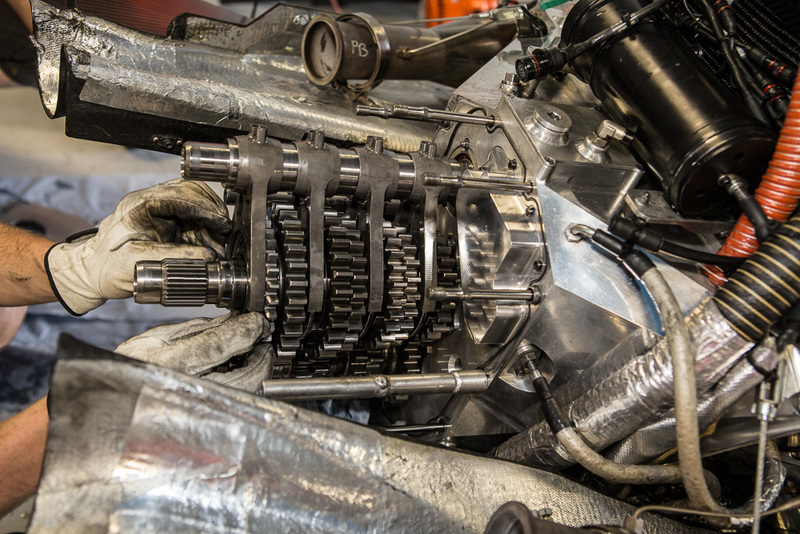 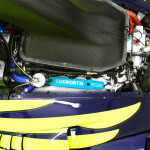 With temperatures of over 35 °C this years Grand Prix was an extreme challenge for the pilots as well as for the cars. 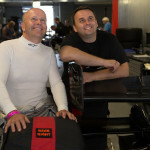 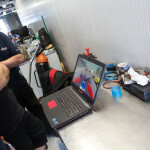 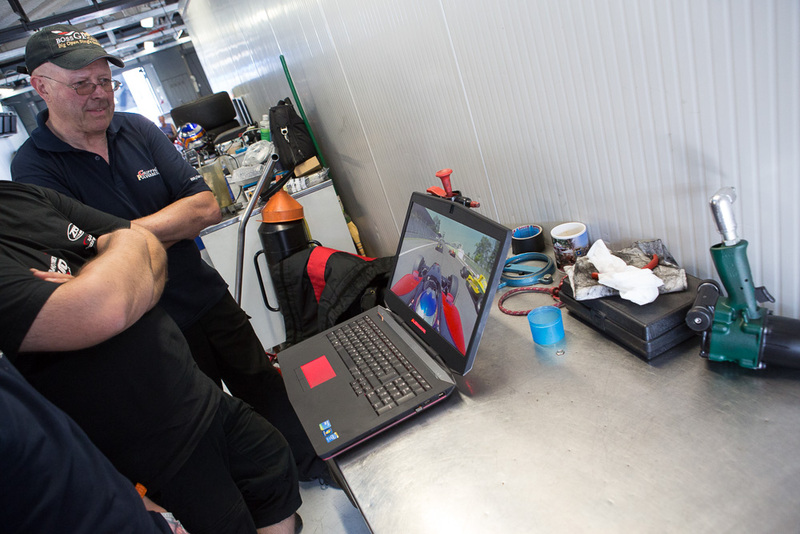 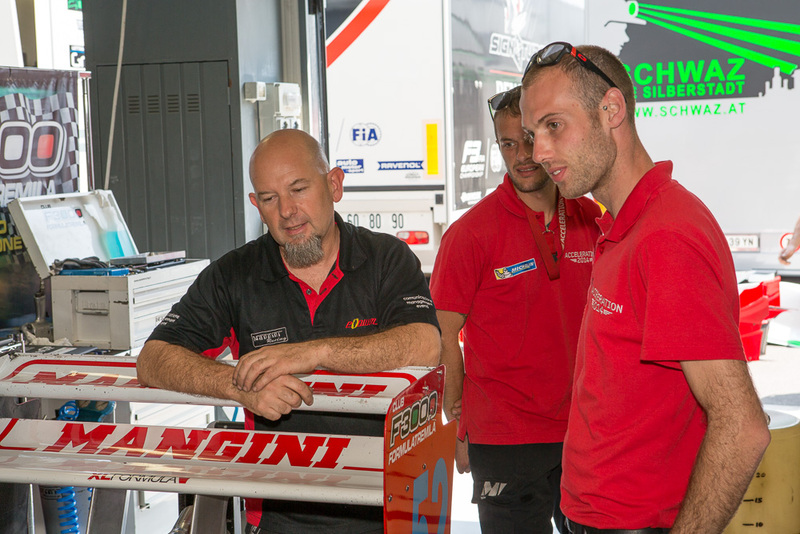 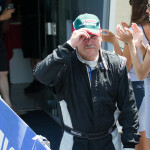 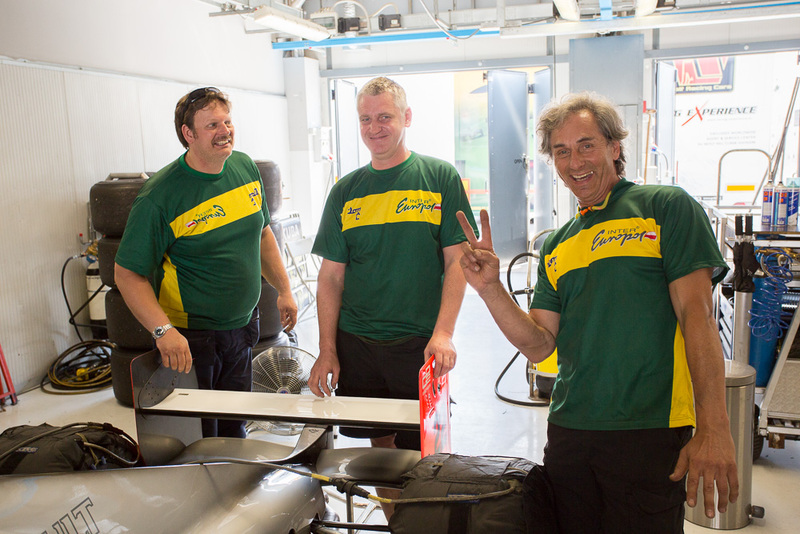 Once again it was Gary Hauser and his team Racing Experience who did best under the given circumstances. 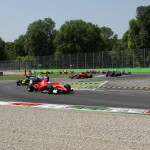 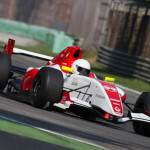 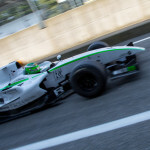 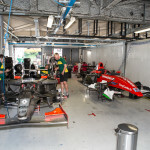 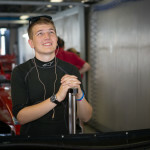 But the first race started with a moment of shock for the young Luxembourger and could have been nearly over in the first turn when Peter Milavec who started from position four overtook Ingo Gerstl and Jakub Smiechowski and caused a collision while trying to take the top position from Hauser. 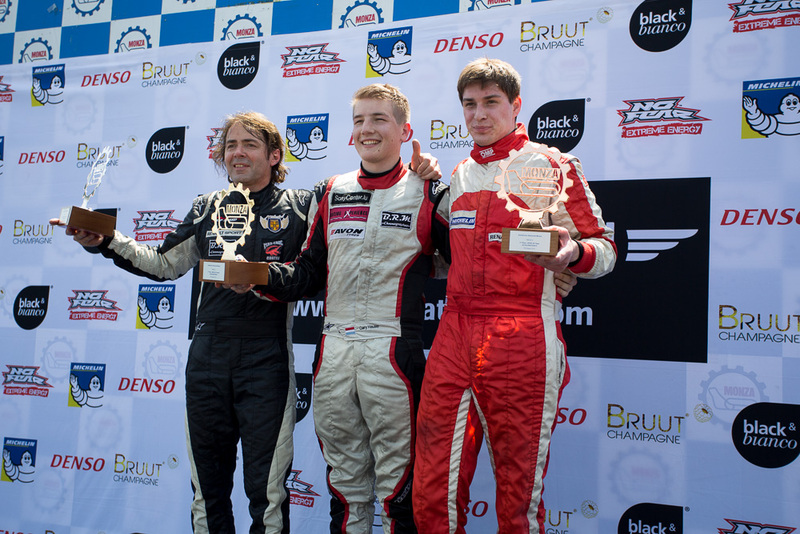 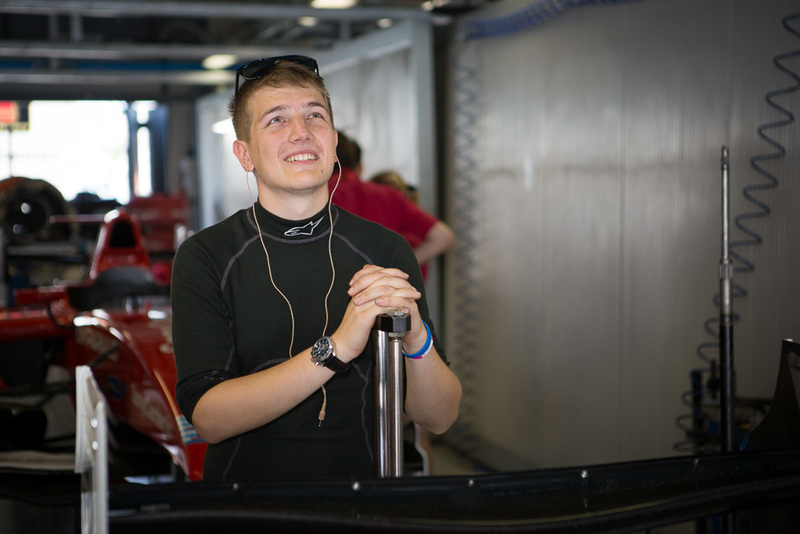 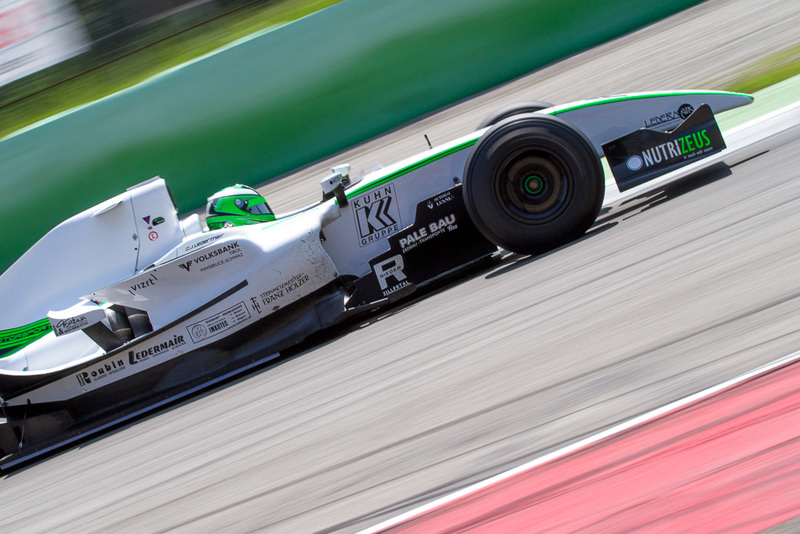 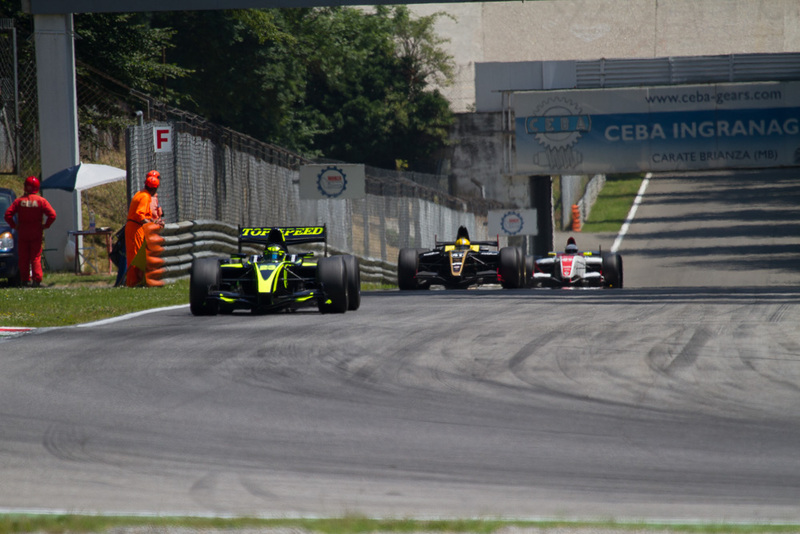 Milavec’s success was of short duration, one lap later he had to give up the race due to technical difficulties. 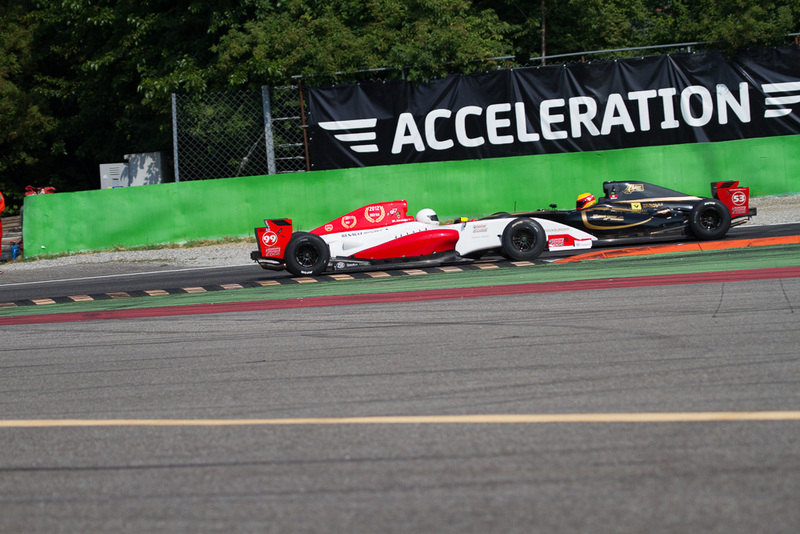 The following laps Ingo Gerstl was heavily attacking Hauser. 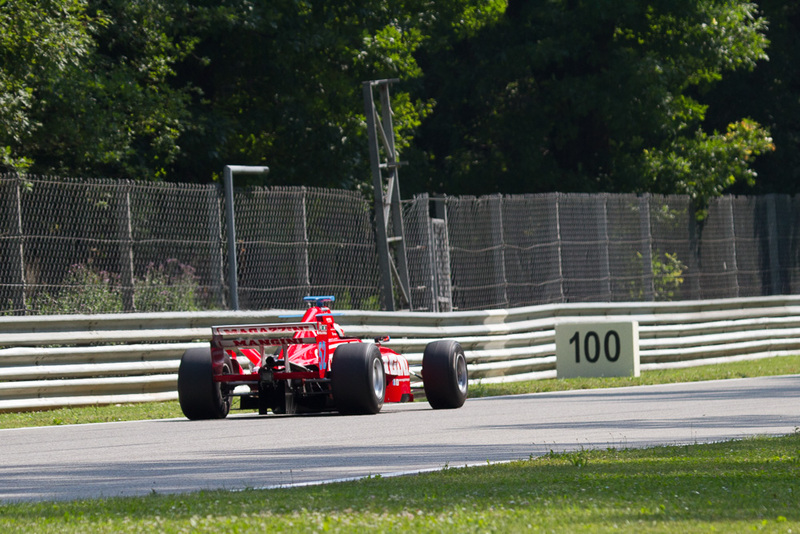 One lap before the end he finally managed to overtake him, only to give up the top position again in the final lap. 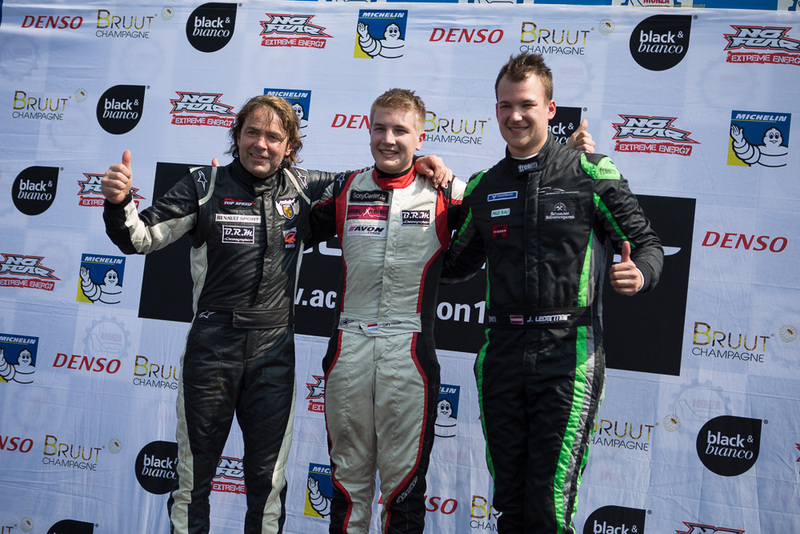 At the end of race one Gerstl finished second behind Gary Hauser and in front of Johann Ledermair on position three. 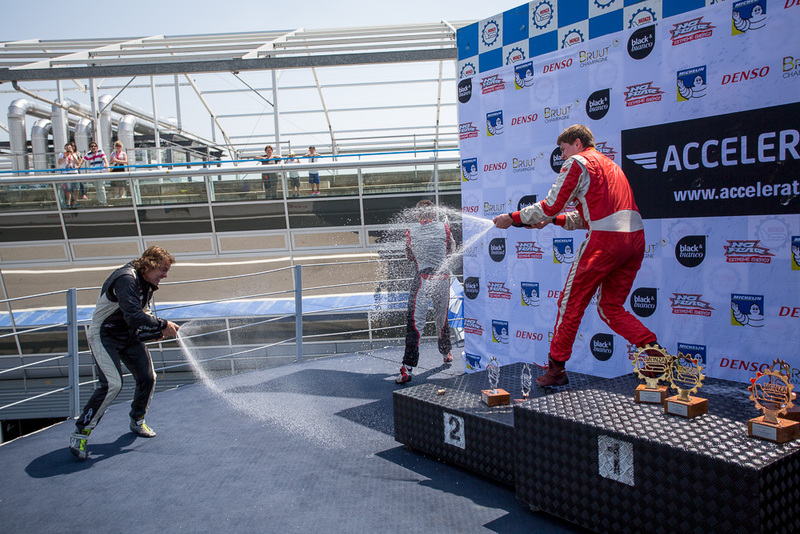 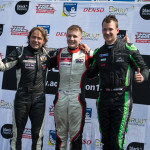 In the MASTERS Class Walter Steding secured his first victory of the weekend in front of Armando Mangini and Christian Eicke, after Hans Laub made a mistake, stuck in the gravel trap and retired from the race. 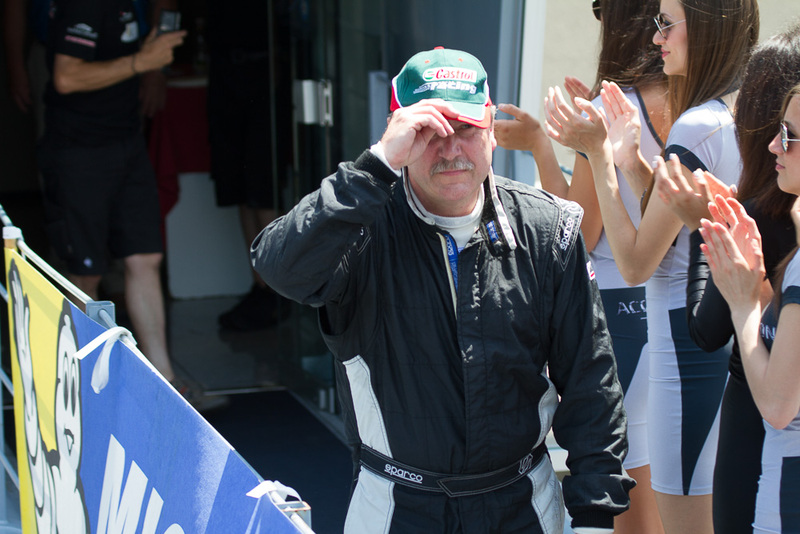 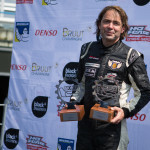 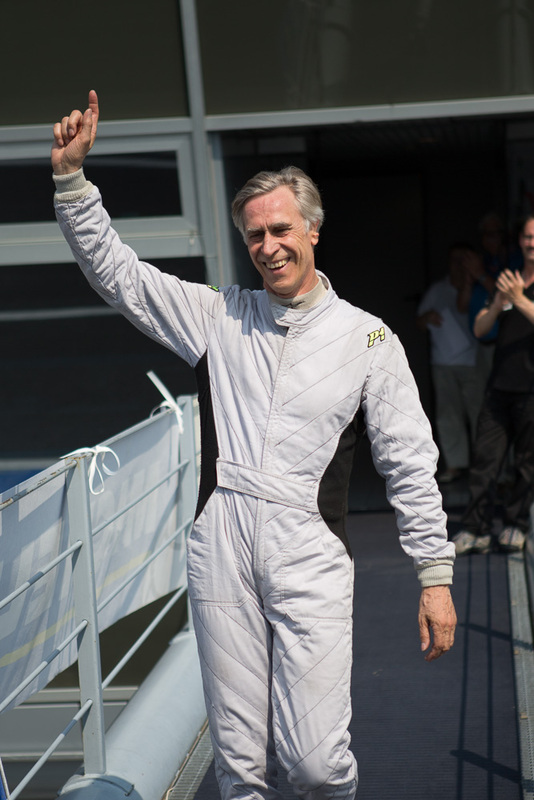 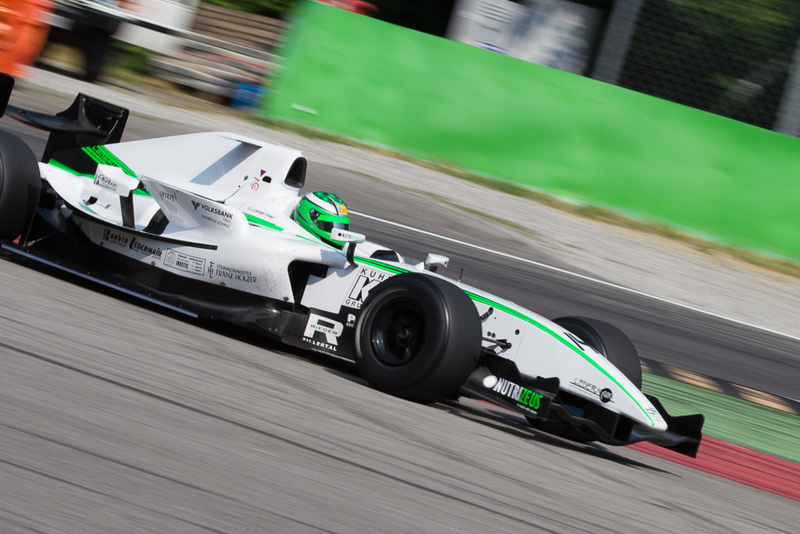 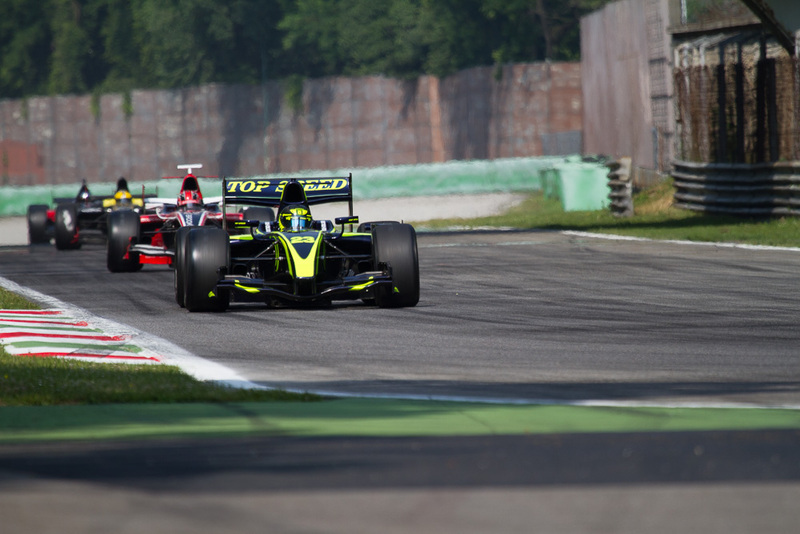 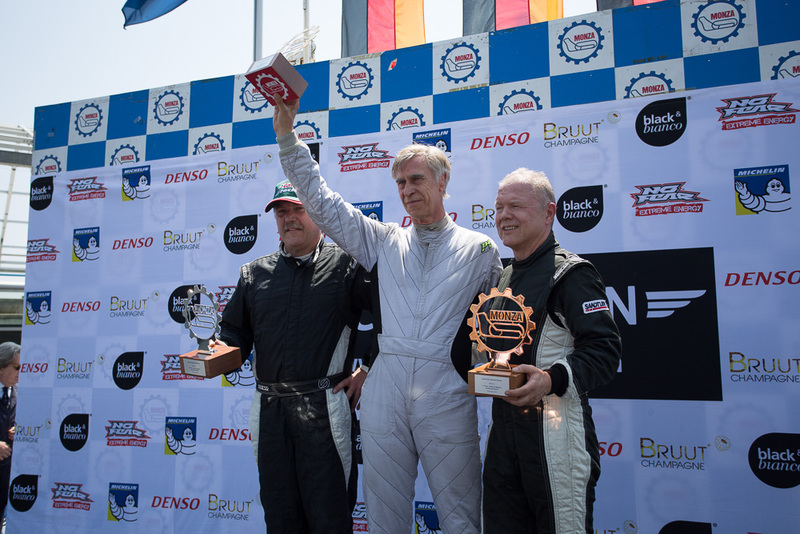 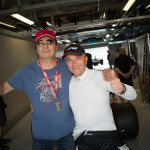 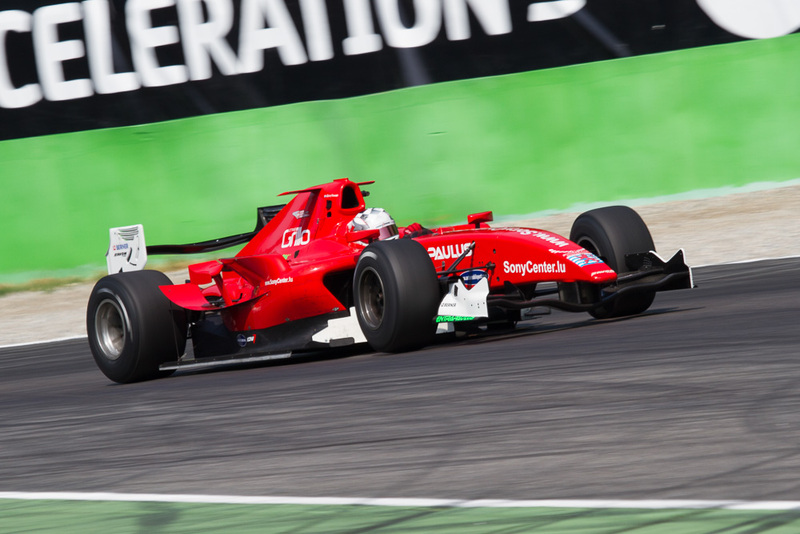 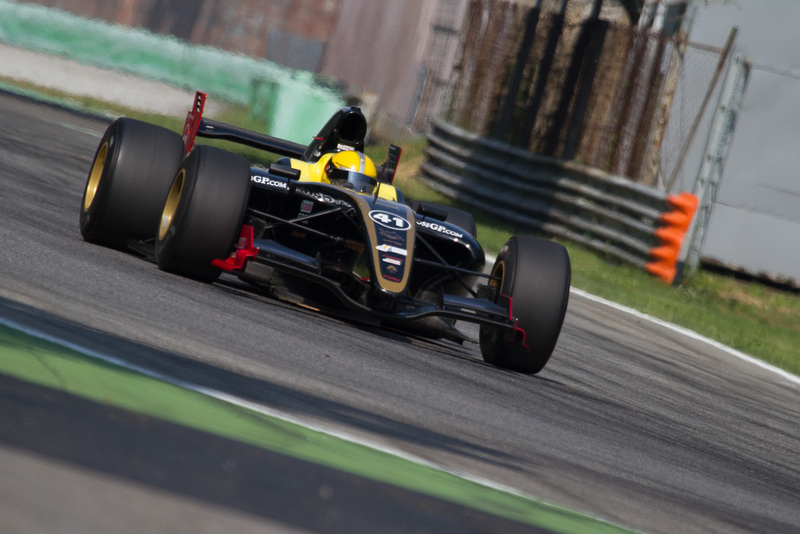 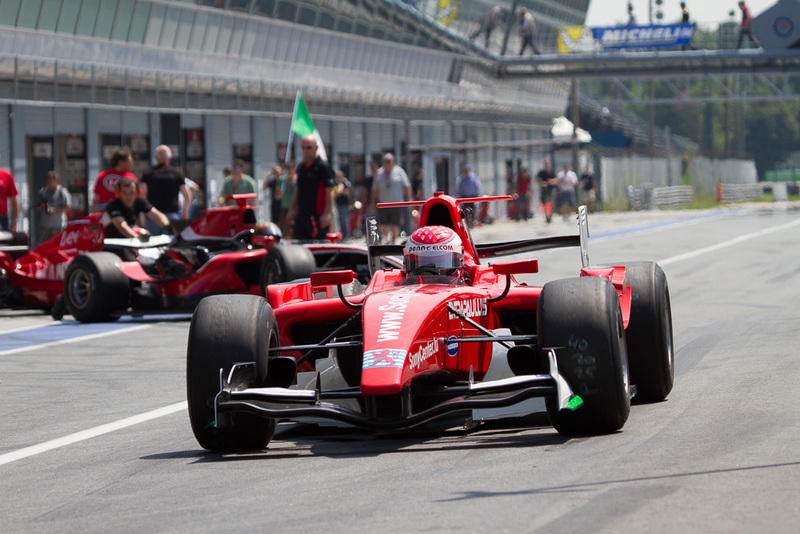 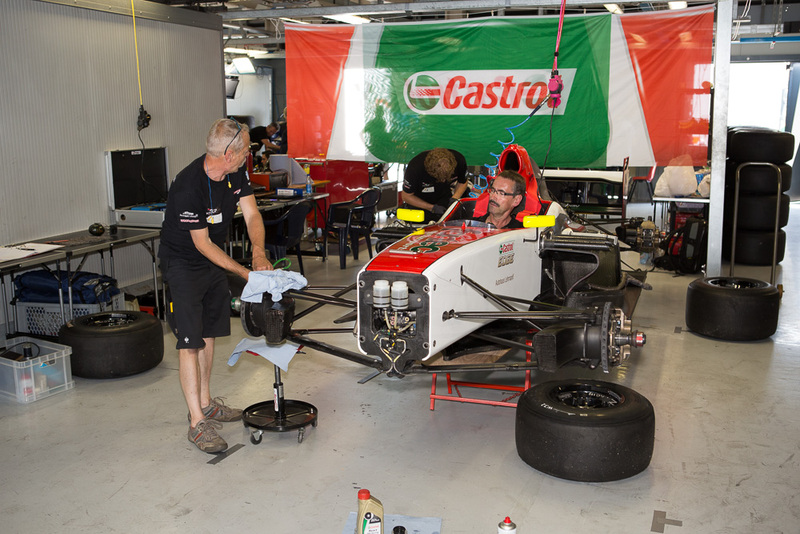 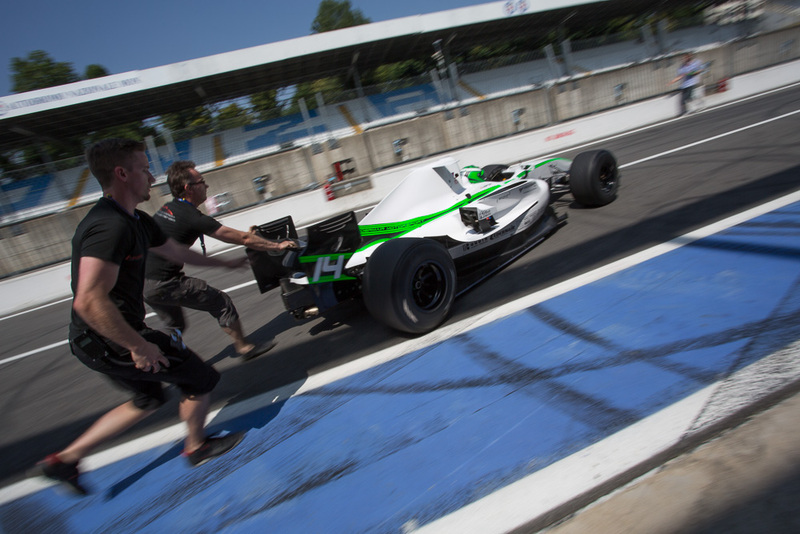 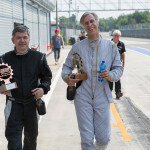 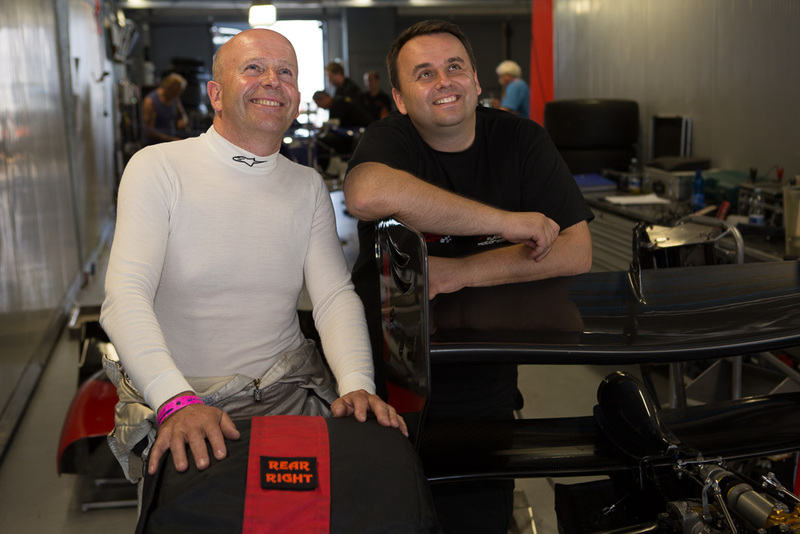 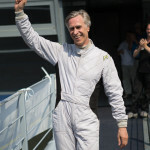 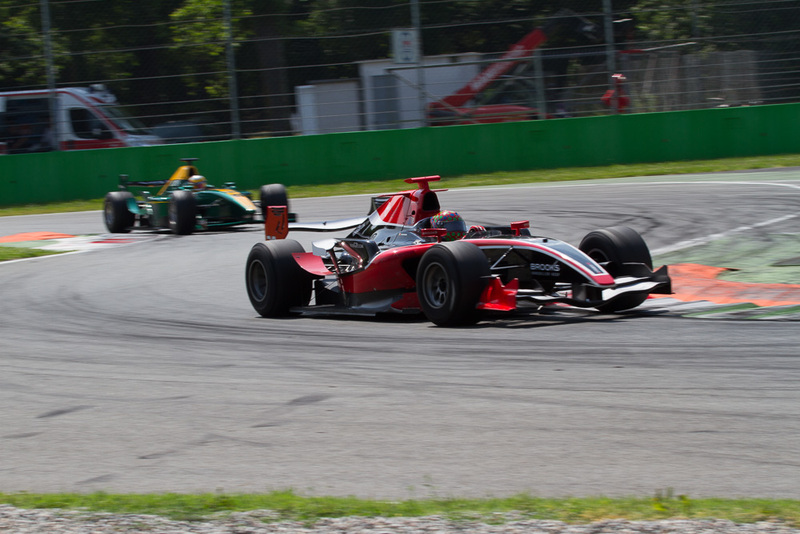 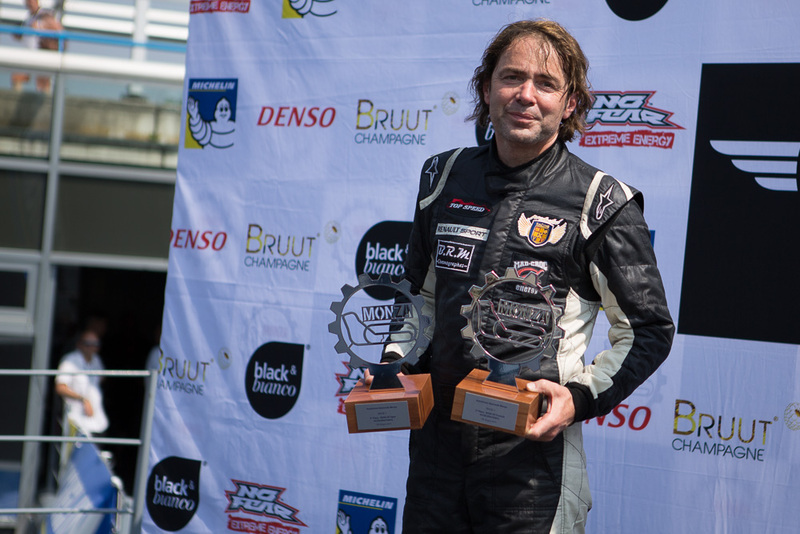 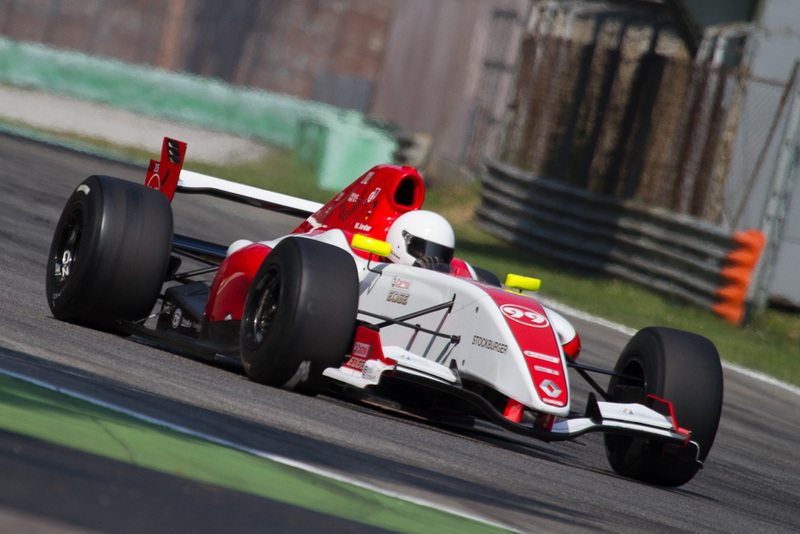 In Race two Gerstl had to fight with technical difficulties and so Gary Hauser was able to secure his sixth victory in his sixth race of the season in front of Gerstl. 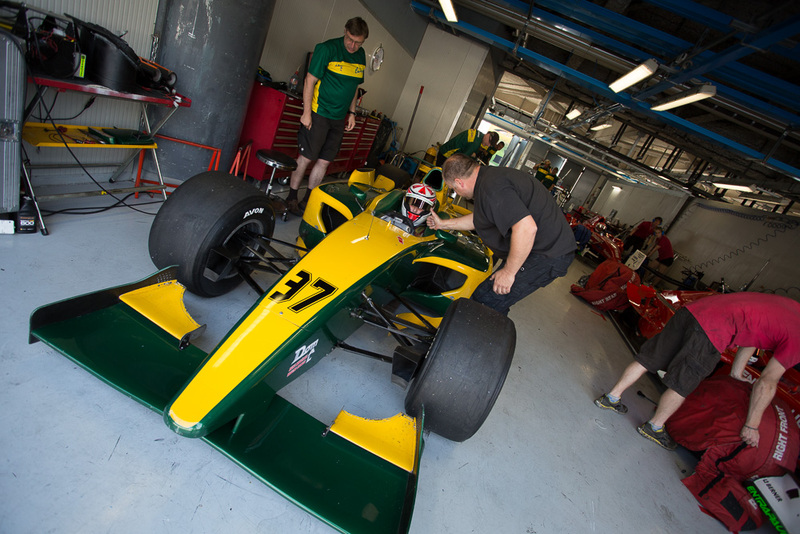 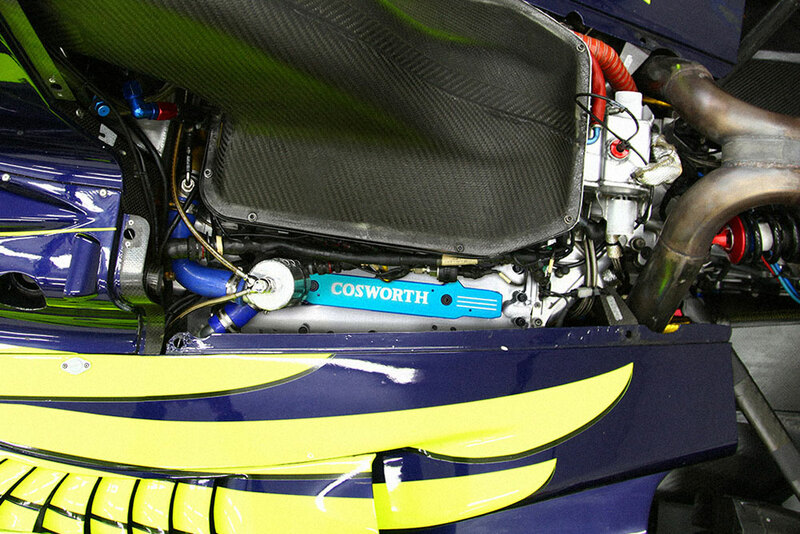 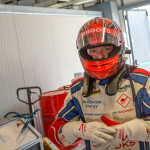 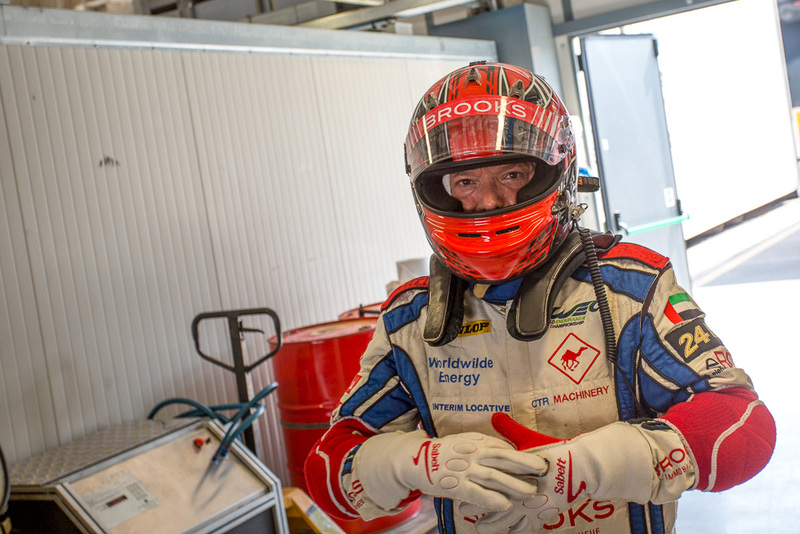 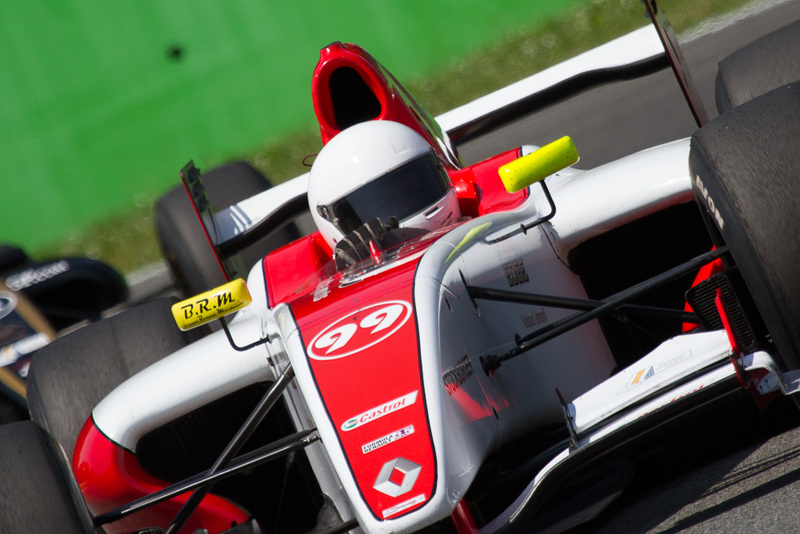 Jakub Smiechowski who dropped out from race one crossed the finish line with a failing engine on position three. 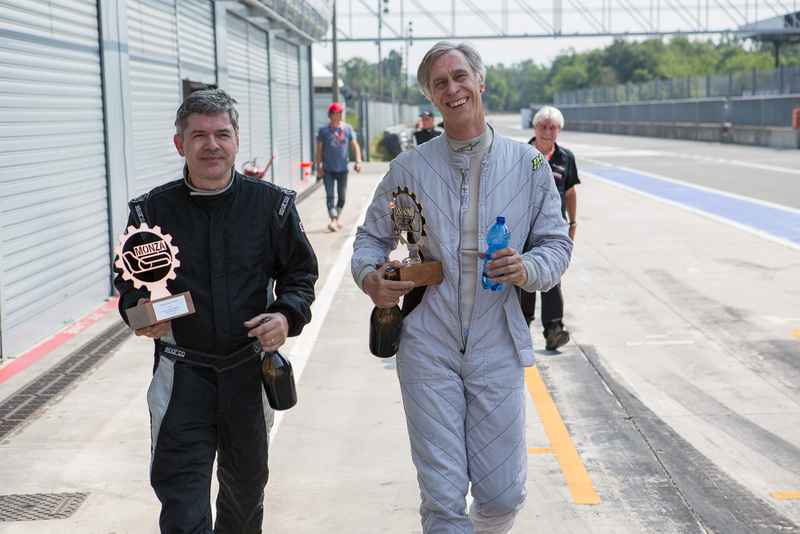 A way more intense battle was raging between Walter Steding and Hans Laub, who fought for the top position in the MASTERS Class. 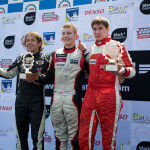 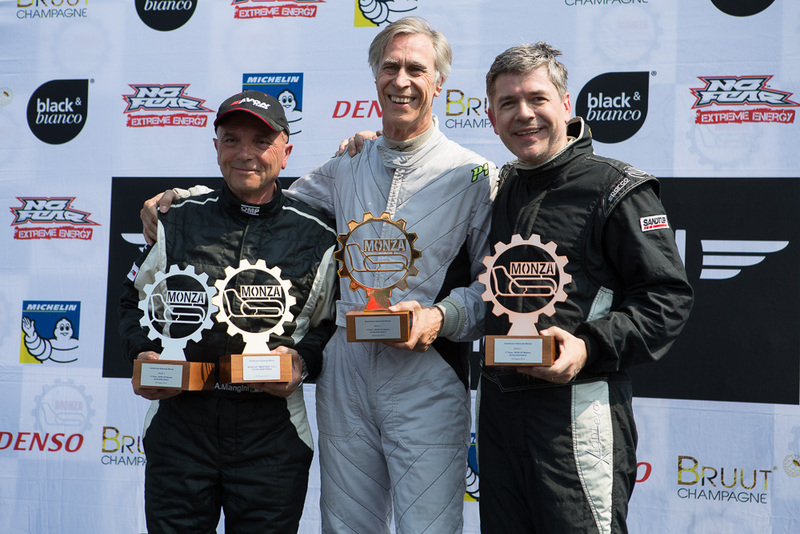 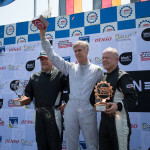 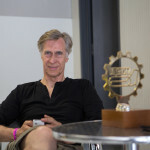 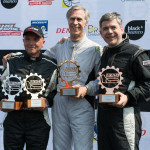 Although Laub drove the faster pace, Steding was able to defend his top position and secure his second victory in front of the two Speed Center pilots Hans Laub and Wolfgang Jordan. 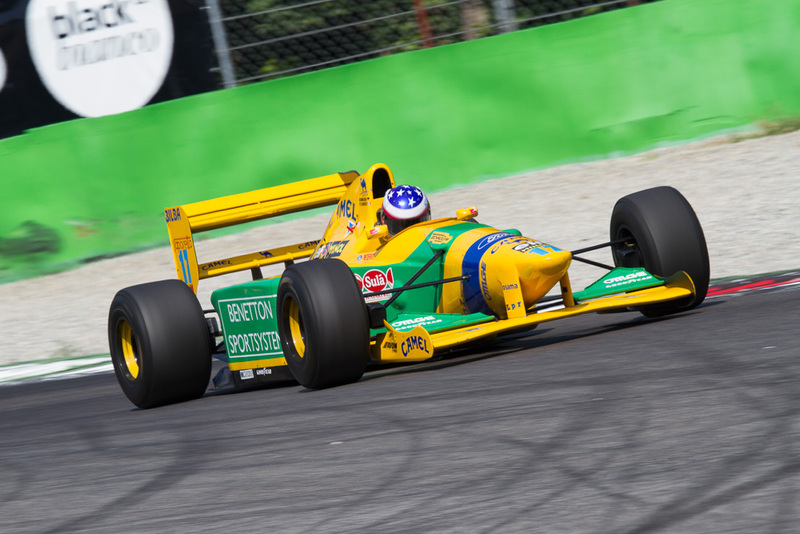 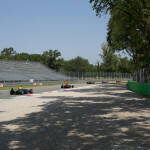 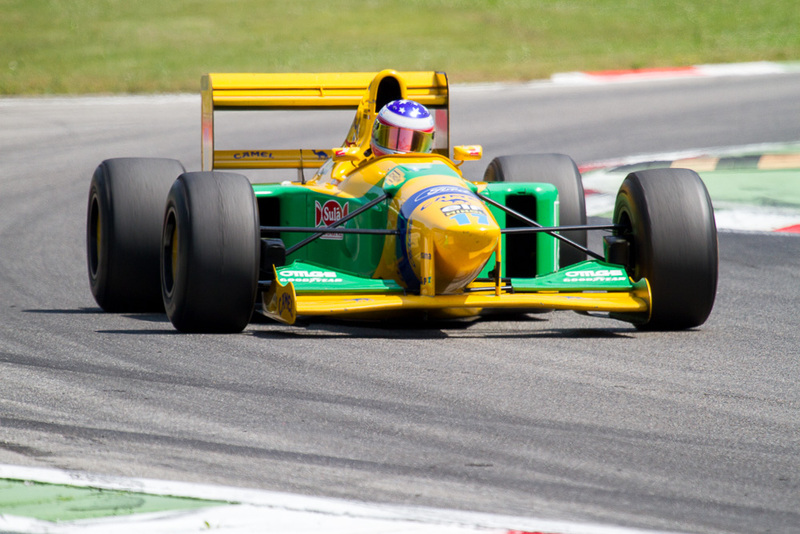 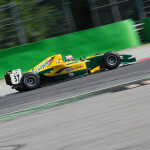 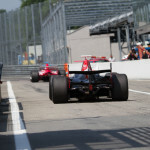 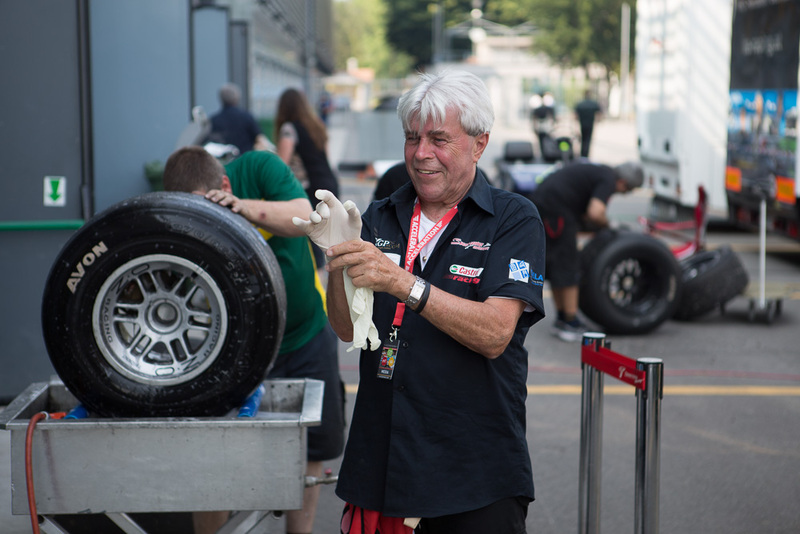 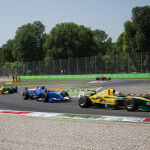 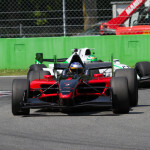 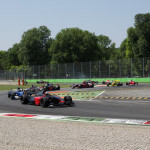 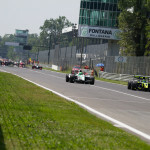 For former Championship leader Bernd Herndlhofer the Grand Prix Monza was less successful, with an overheating engine in race one and a trip into the gravel in race two, Herndlhofer had to go home with zero points.